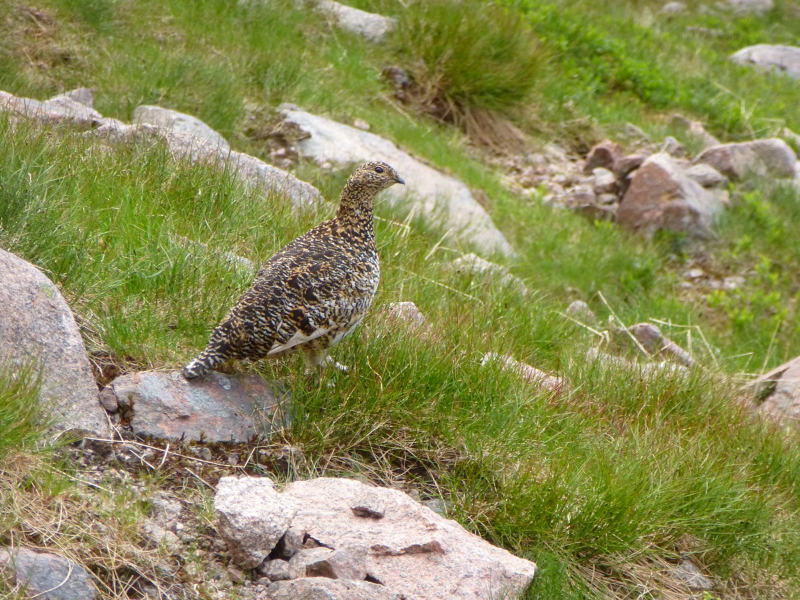 There were some cracking days on the peaks and a climbing day at Neist where the wildlife stole the show. 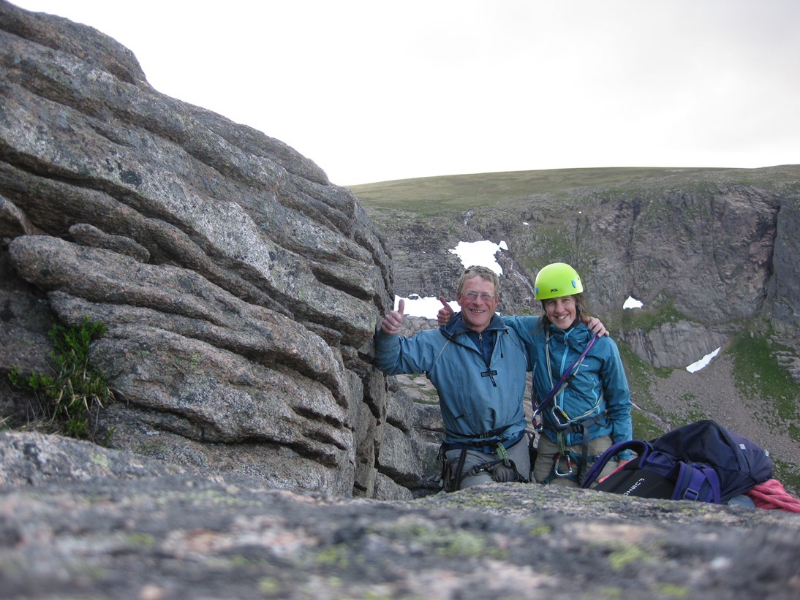 Thanks to Guy Andy & Gillian for keeping their clients happy and well throughout the week too. 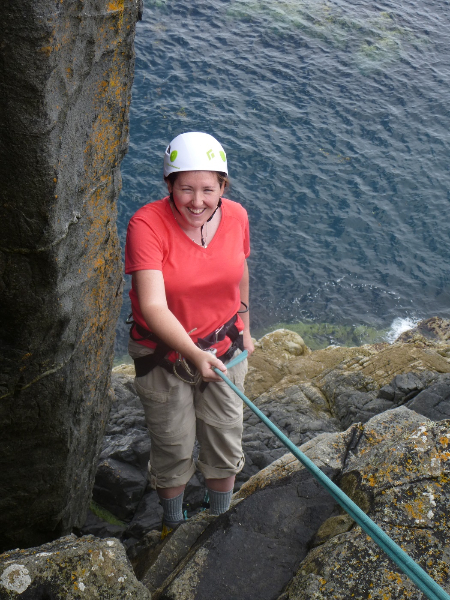 With the weather breaking in the west Lucy and I decided to hit the road for the final couple of days of her week. 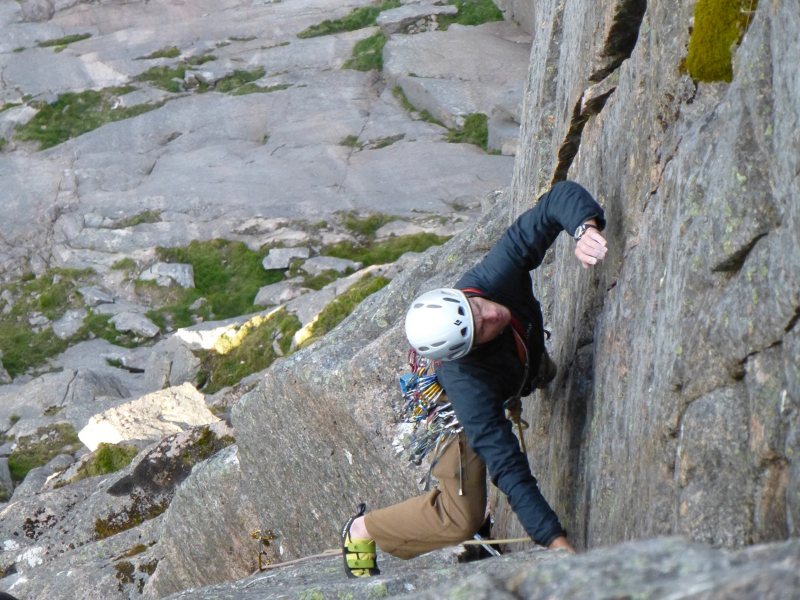 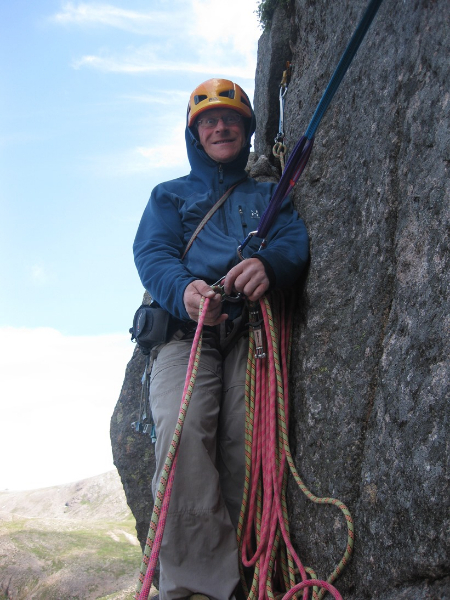 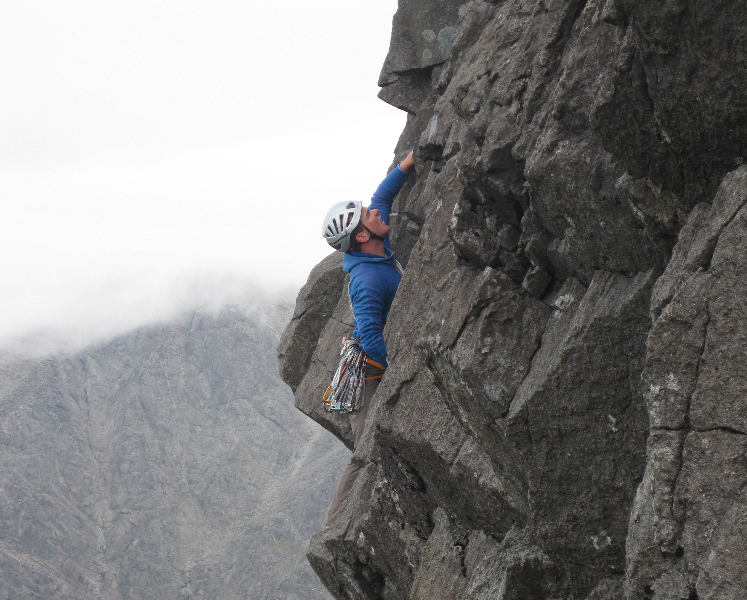 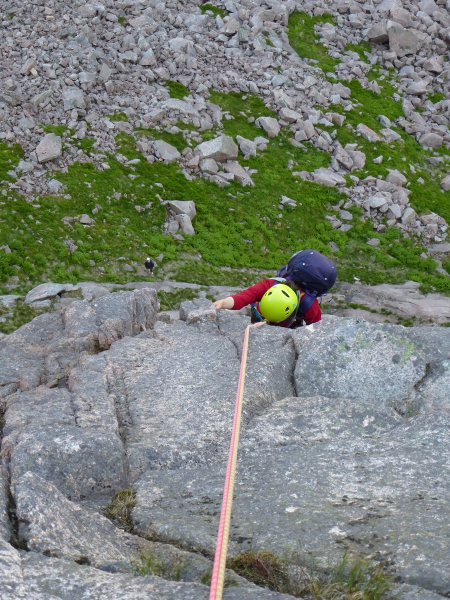 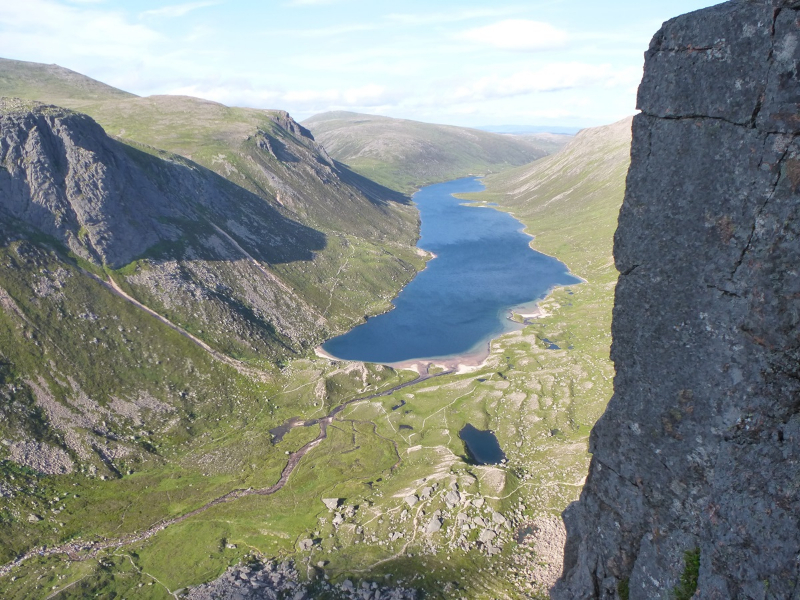 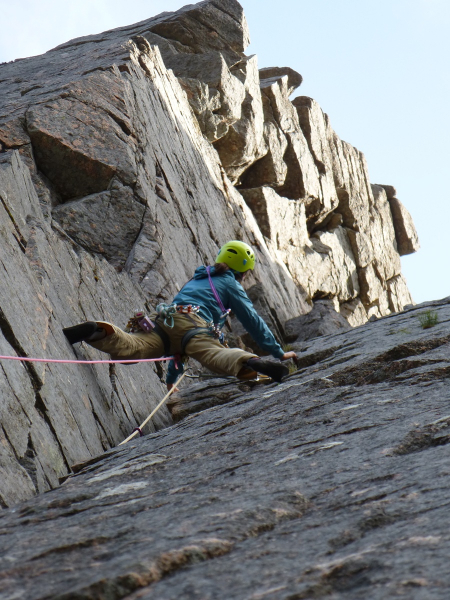 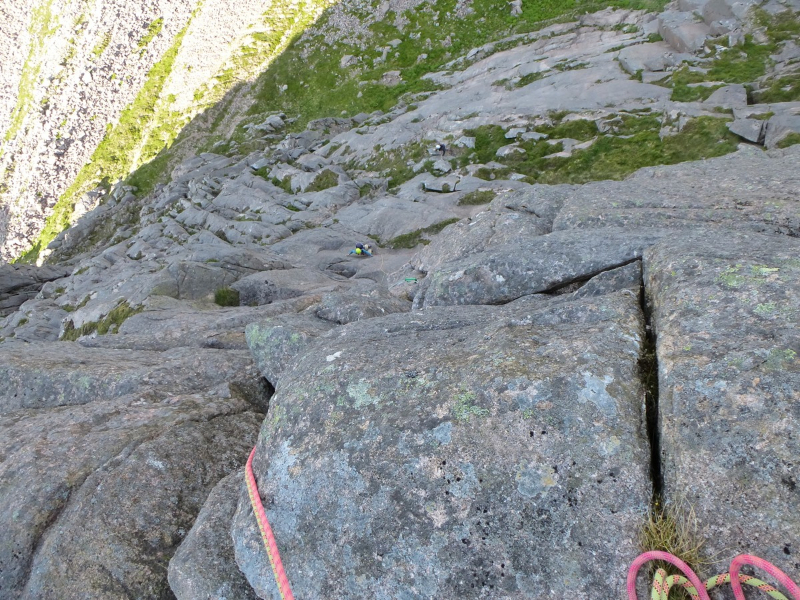 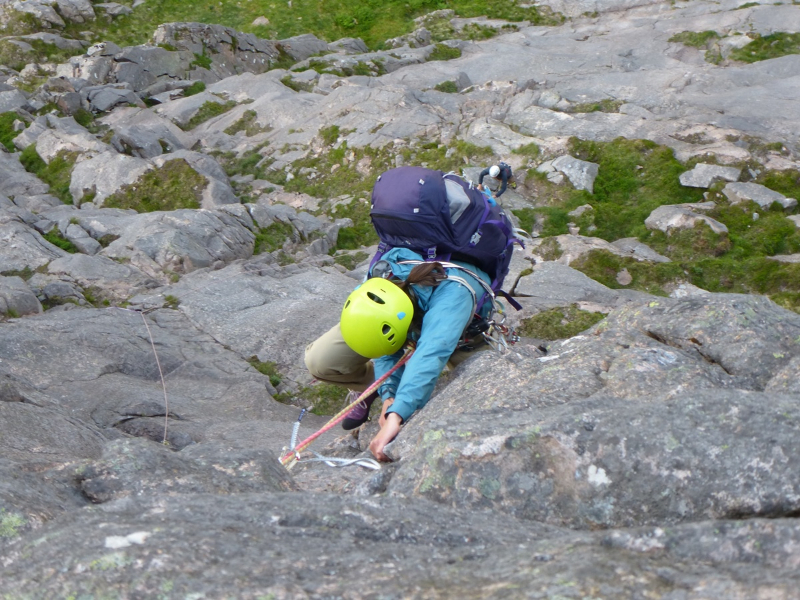 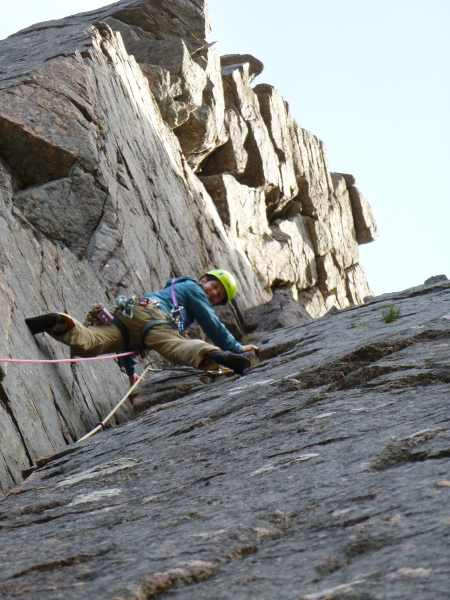 King Bee on Creag Dubh at Newtonmore gave us our fix of 3 star climbing on the journey across but we were saving energy for what looked likely to be a massive day next day; and so it proved! 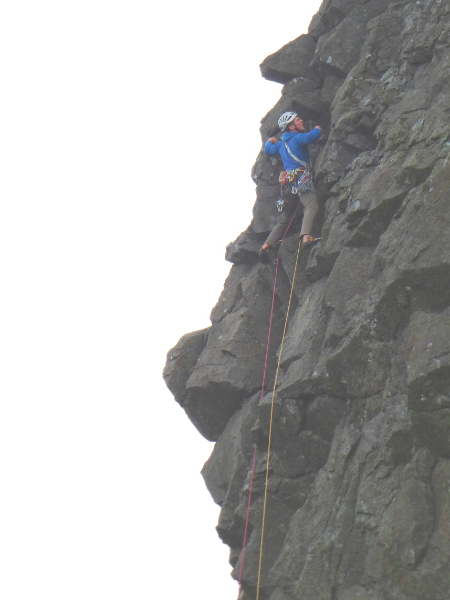 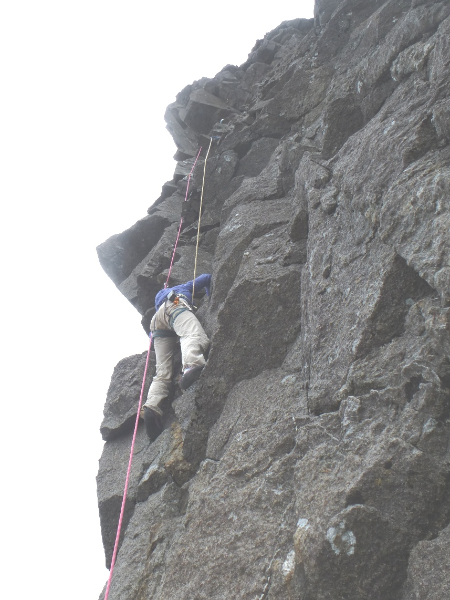 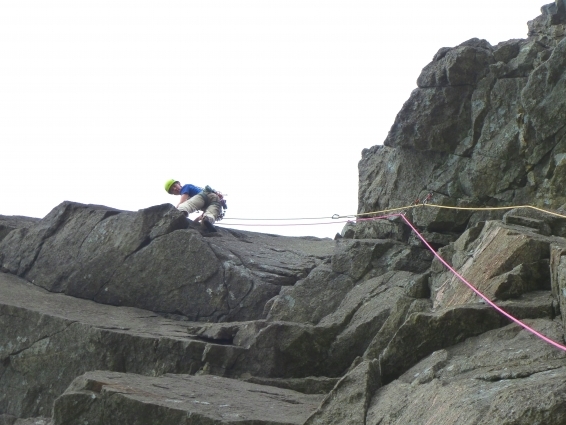 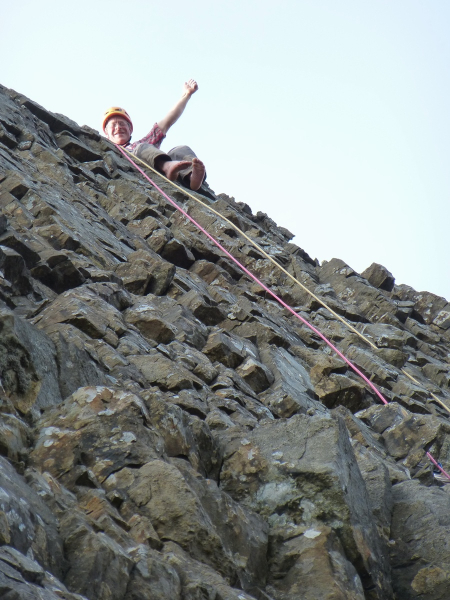 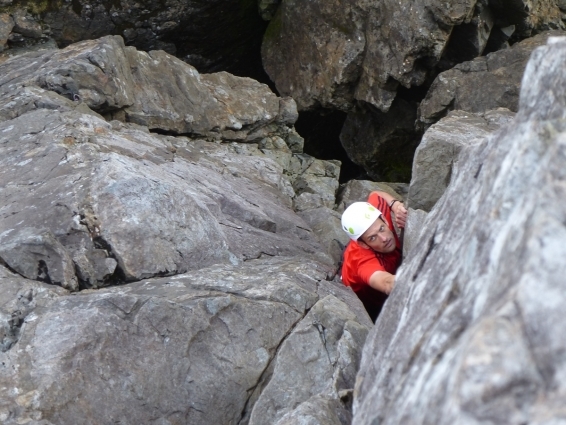 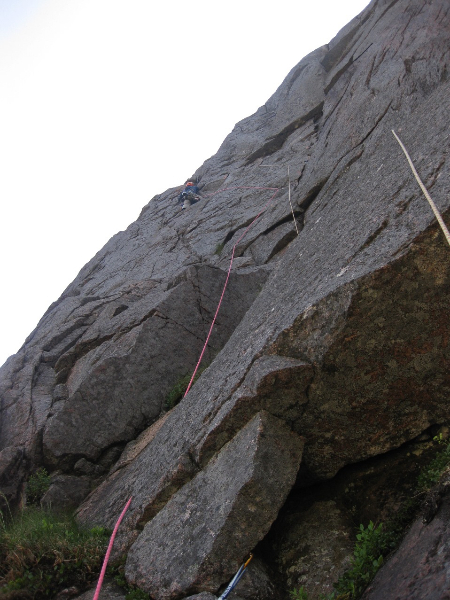 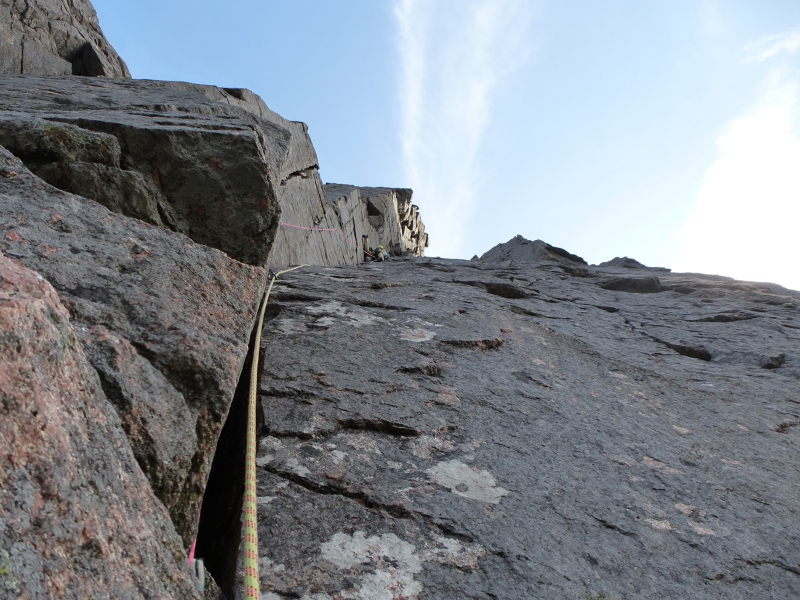 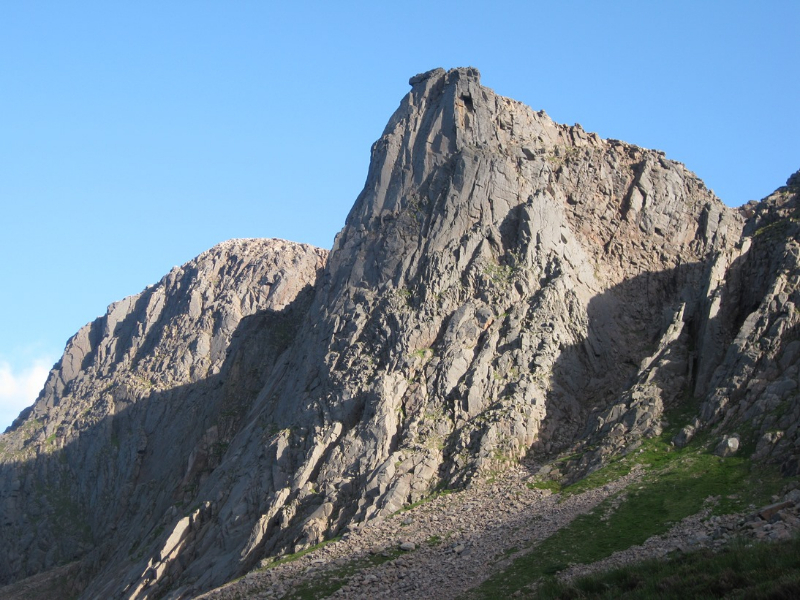 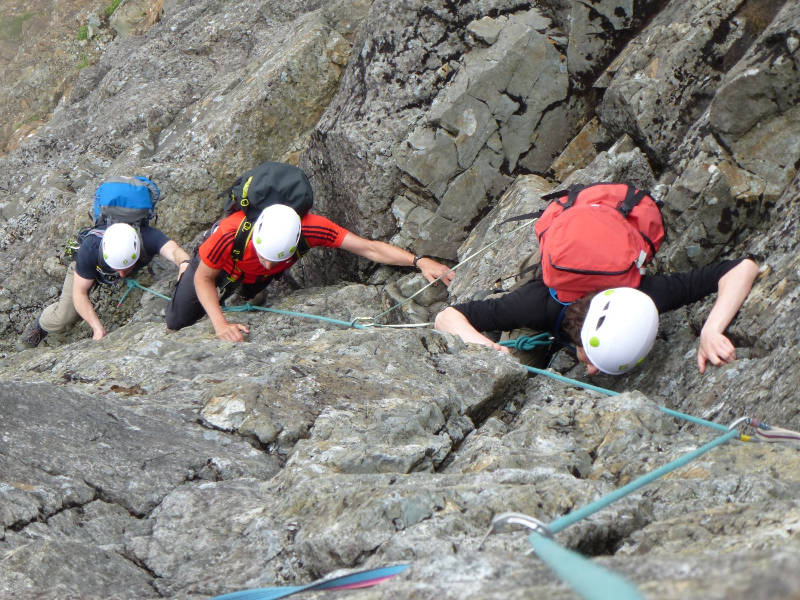 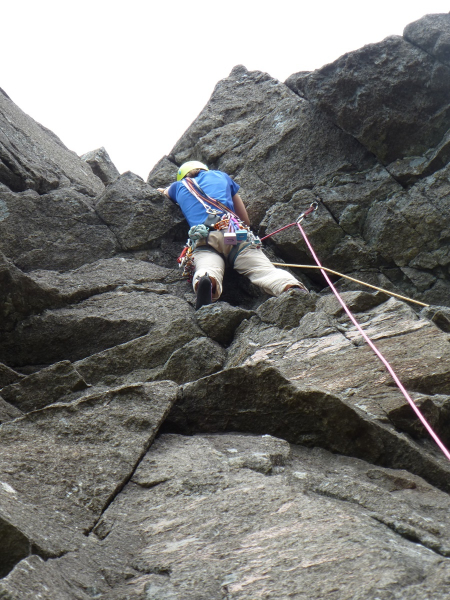 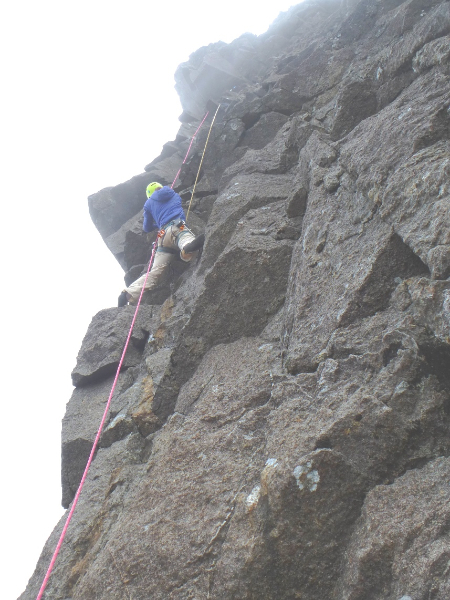 The Needle on the Shelterstone Crag is a classic route cleverly weaving its way up the enormous clean face to reach Needle Crack and finally thread the eye to reach the top. With alternating pitches of 4b, 5b, 4b, 5b, 4c, 5a, 4b, 5a, 4b it looked like we could alternate leads to give a perfect culmination in a week where Lucy’s leading has shot up from V Diff to confident VS. 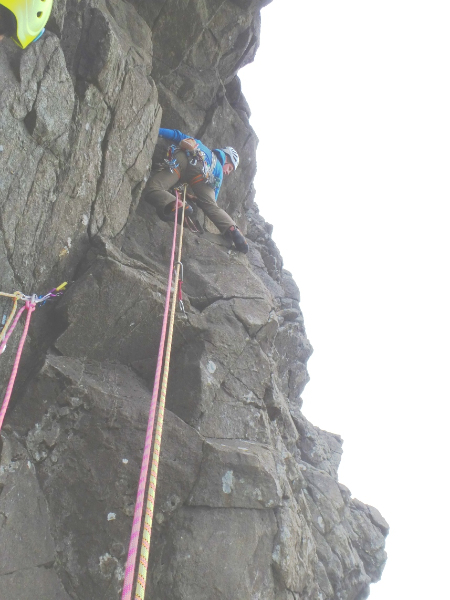 The day was a long one, the tale even longer but culminated with Lucy leading the Needle Crack in superb style while I followed in a more agricultural fashion on the fantastic lay-back holds. 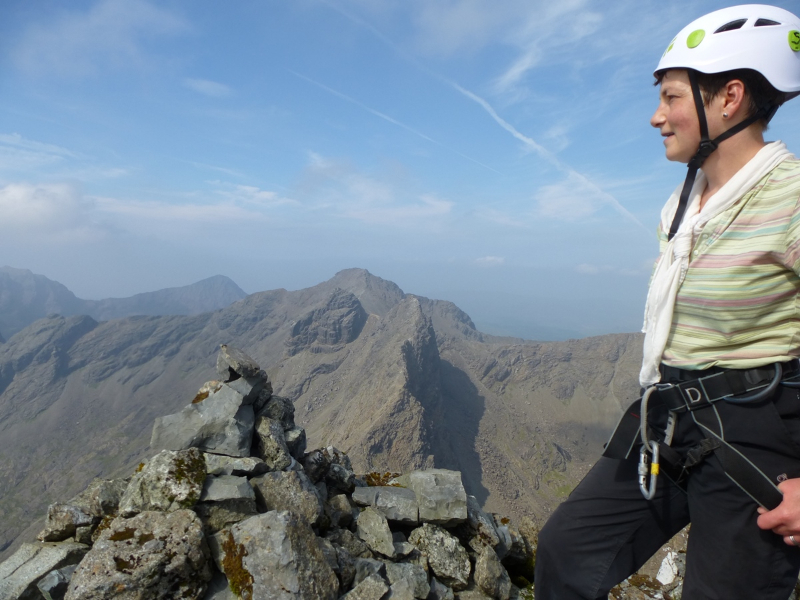 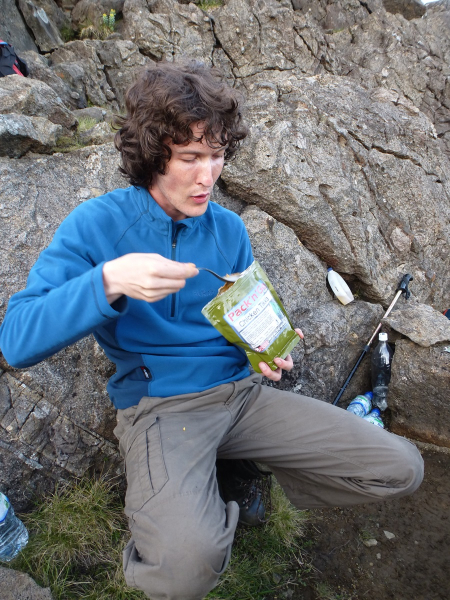 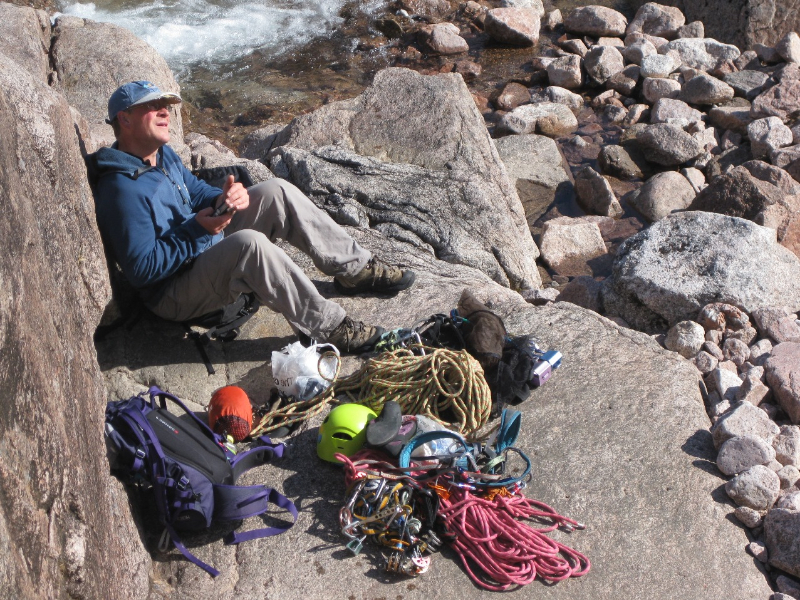 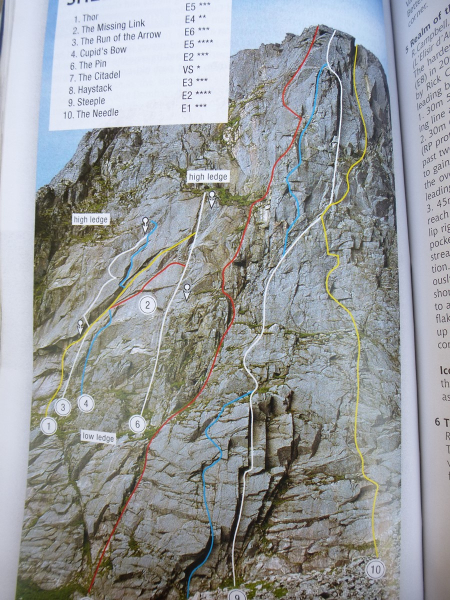 All the routes open to her now dawned upon Lucy as she browsed Scottish Selected Rock Climbs over breakfast! 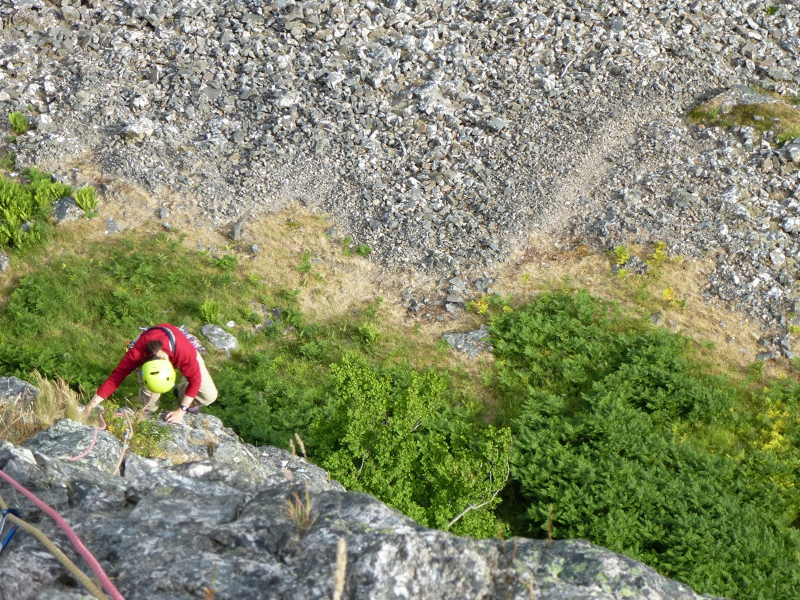 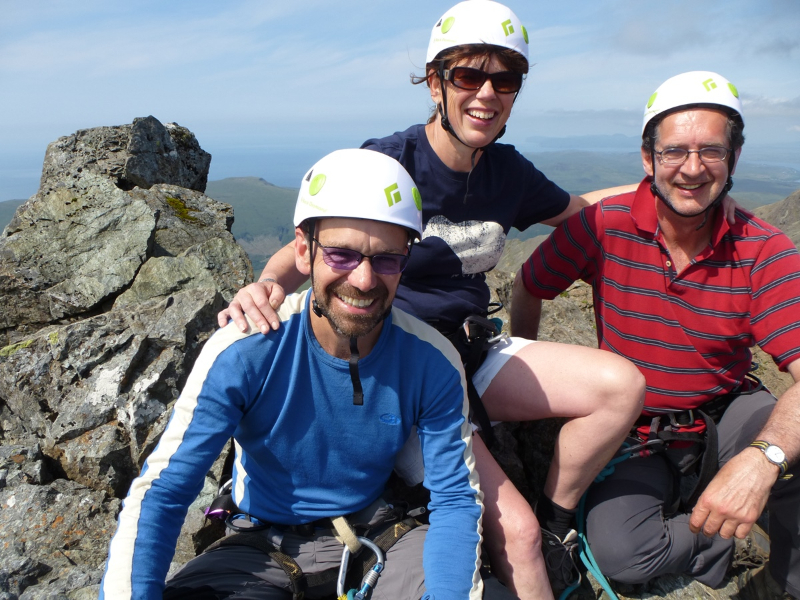 Phenomenal 2 days of climbing with Lucy and Guy. 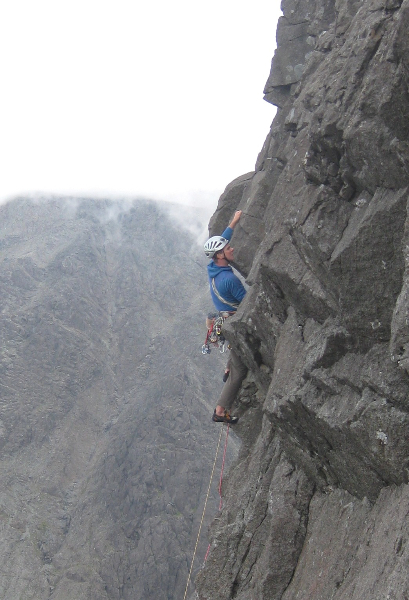 A beautiful night out and a very tired body.We managed 4 new routes, all with very different characters. 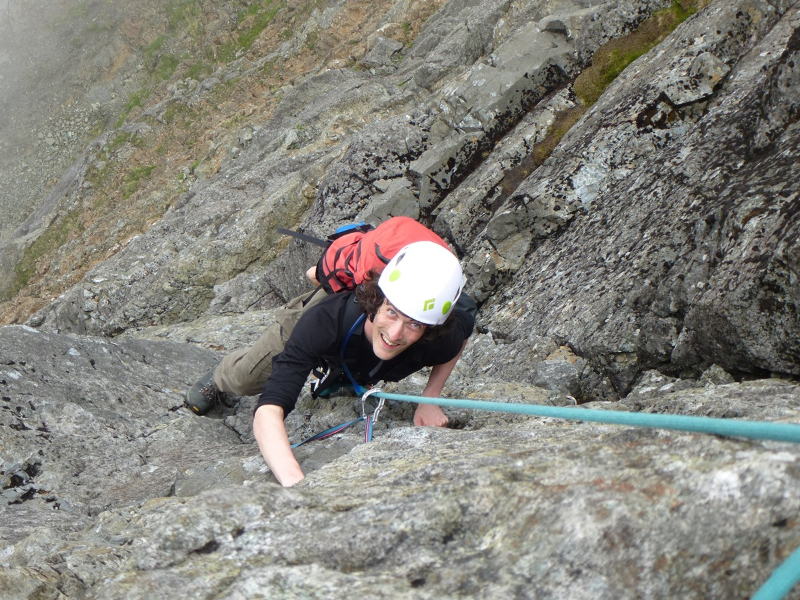 Lucy made her first VS lead and her first new route with the delightful Jacobite, VS 4c. 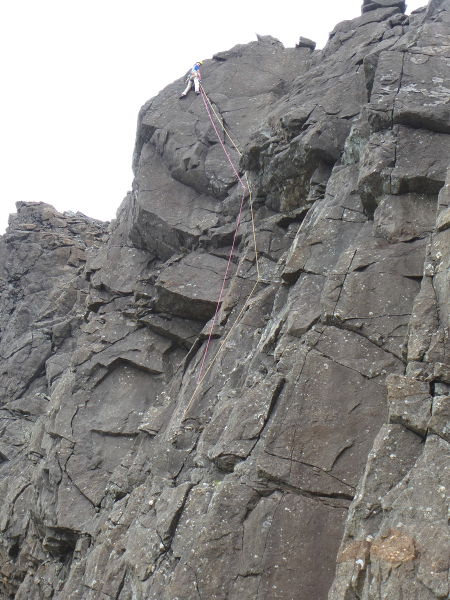 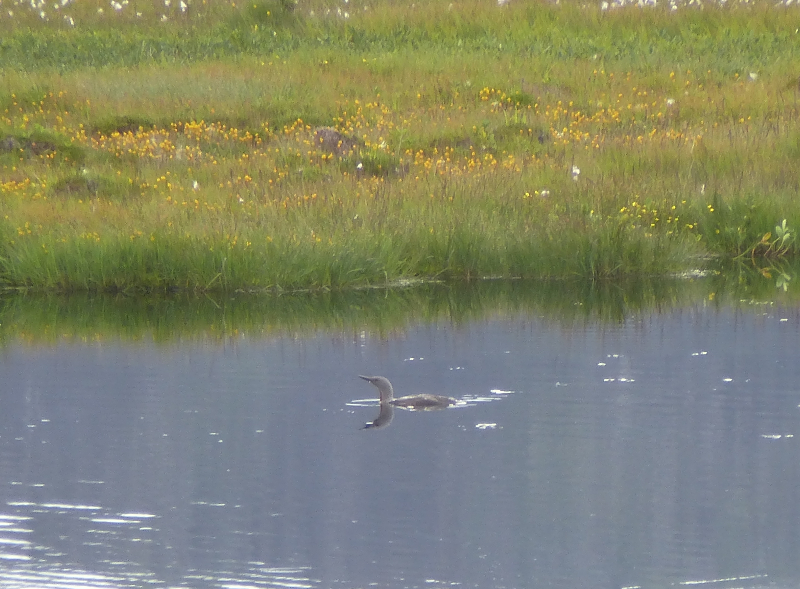 We then headed over to the Garbh Casteil where Diamondhead gave an improbably superb outing. 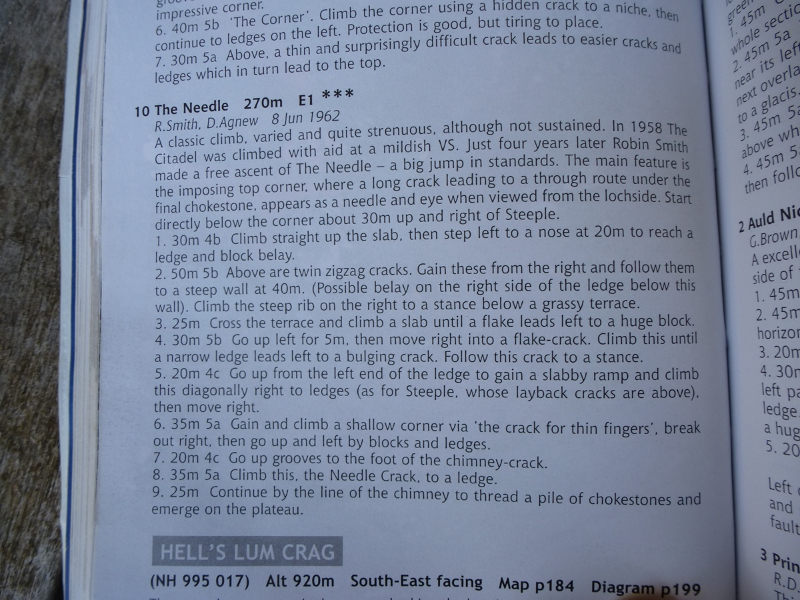 Definite 3 star recommendation but I’m finding it hard to grade. 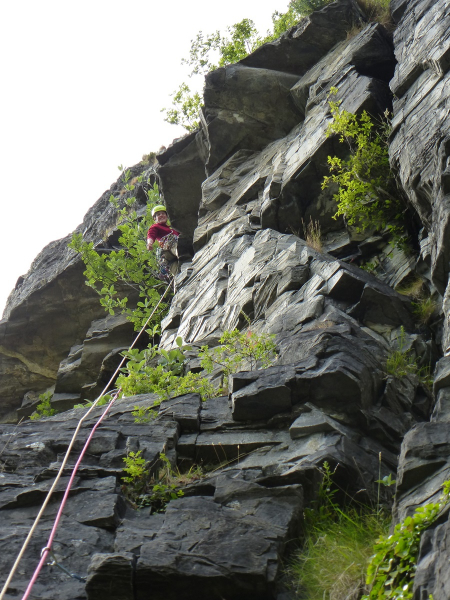 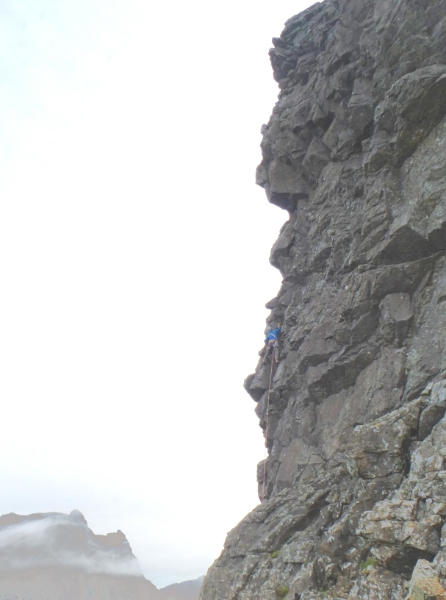 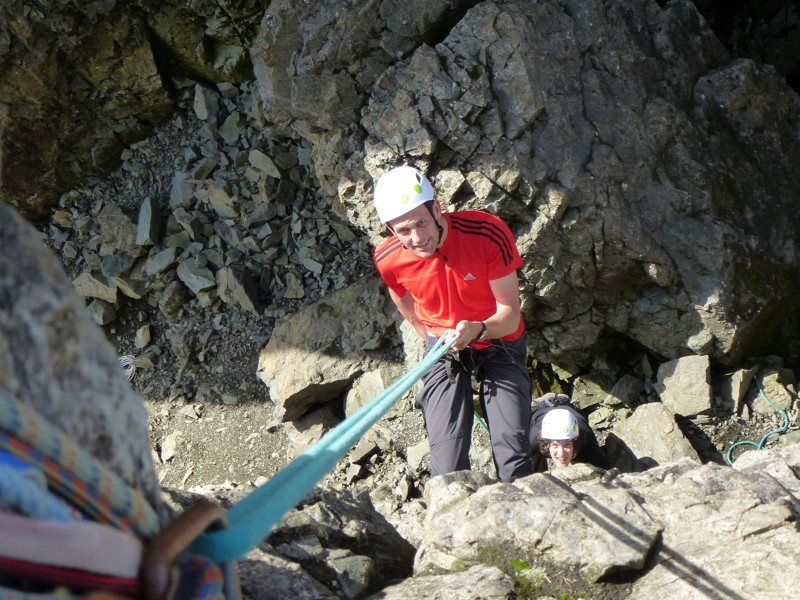 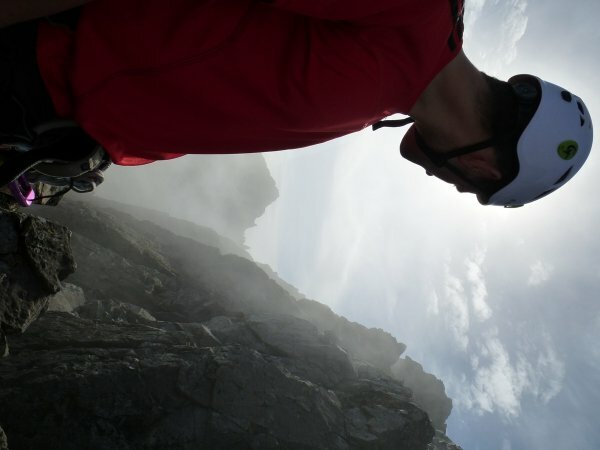 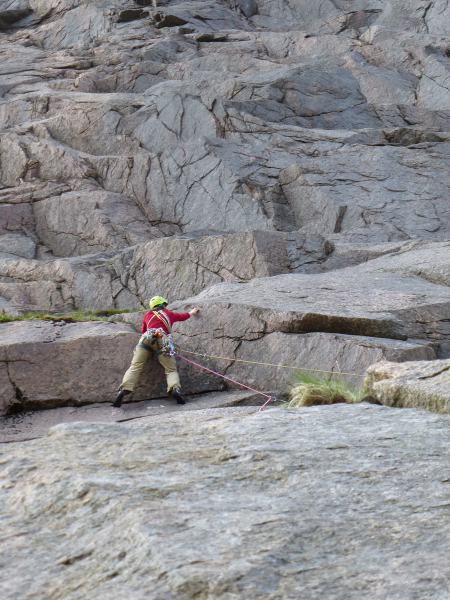 A 40m vertical wall covered in huge holds but requiring caution and a steady head for the final 30ft run-out to the top. 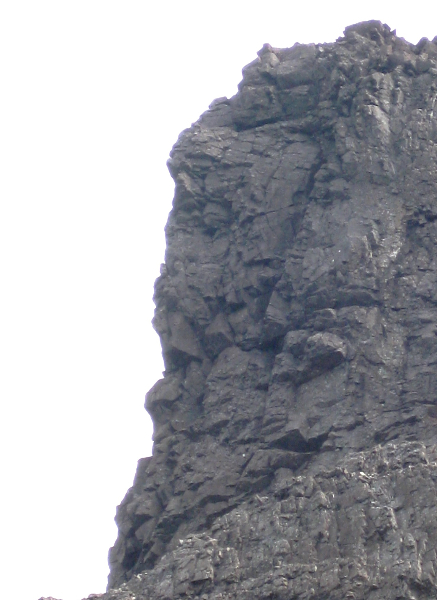 V Diff or VS? 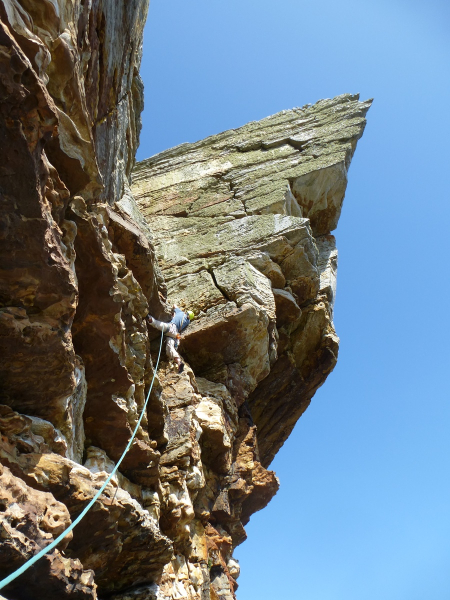 Severe 4a is probably the right result but can’t wait to hear other opinions. 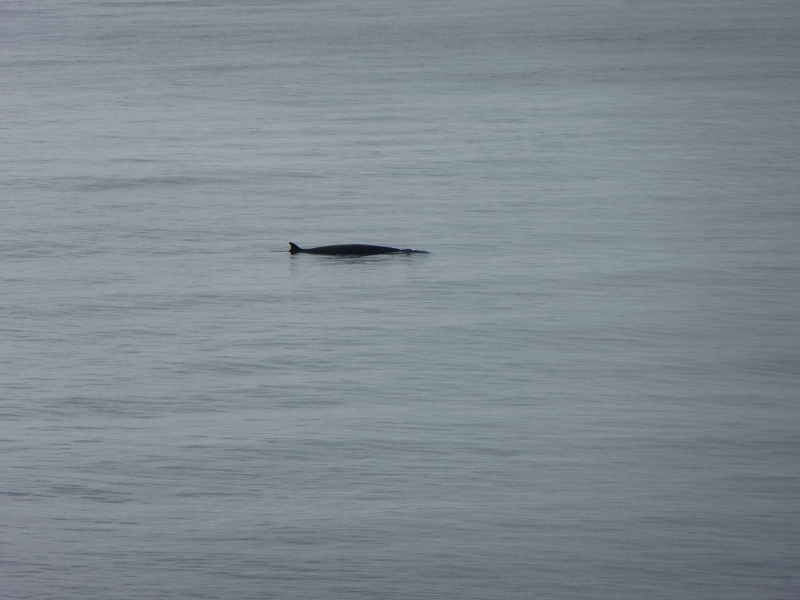 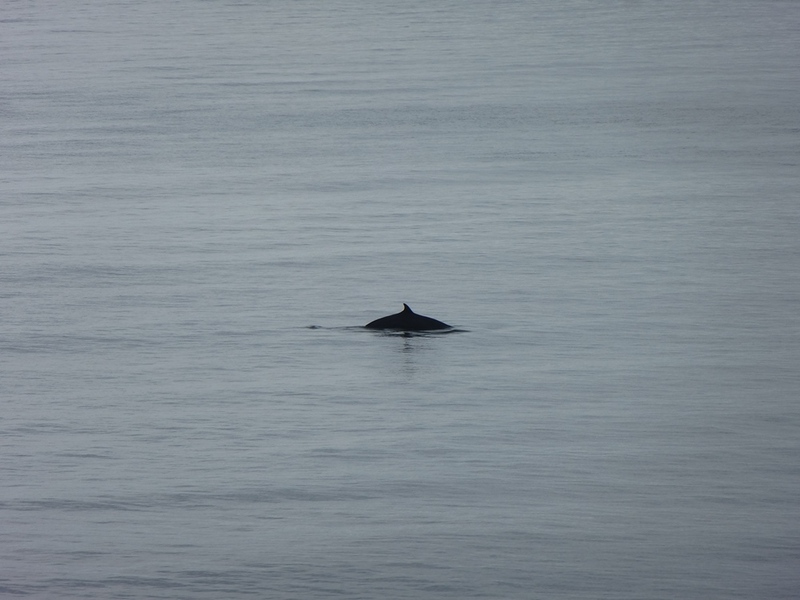 Guy came up to join us next morning. 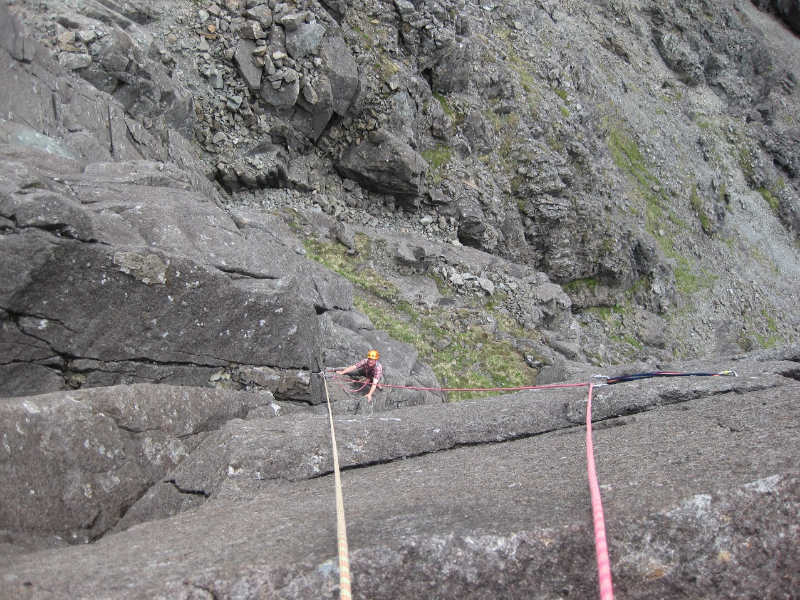 Too Hard for the Old Man (E2 5b) takes a very steep line up the south side of Sgumain’s Final Tower- the Old Man’s face can be seen in the gallery below but you can guess about the cheeky whippersnapper’s naming process…..
After lunch we headed to the Stone Shoot for a return battle with Deliverance that Guy had led this winter. 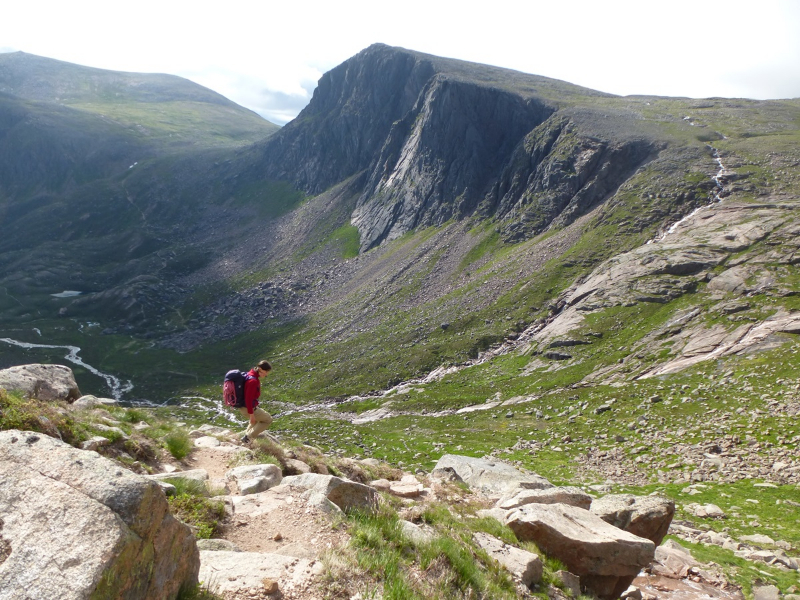 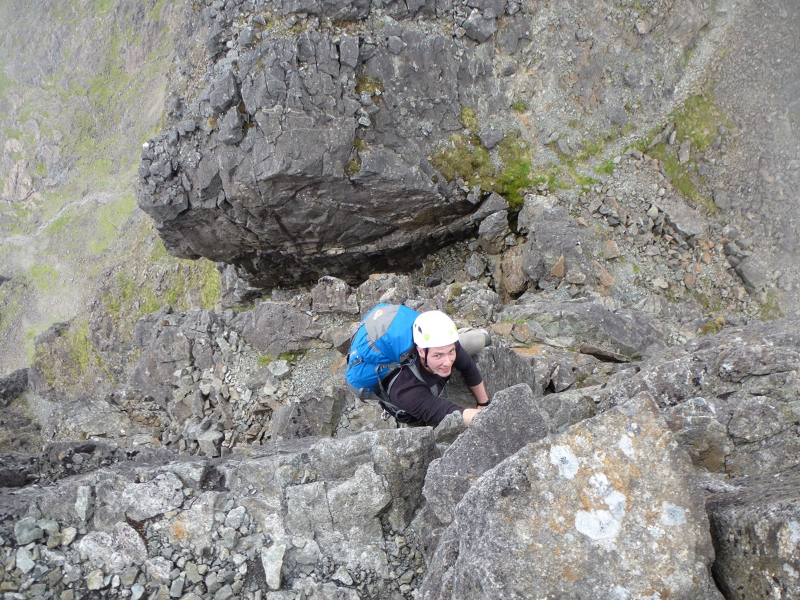 My lead this time & the climb proved just as steep in summer conditions and also E2 5b. 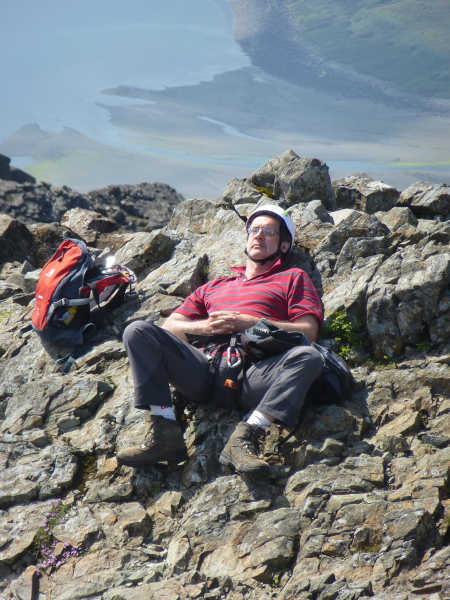 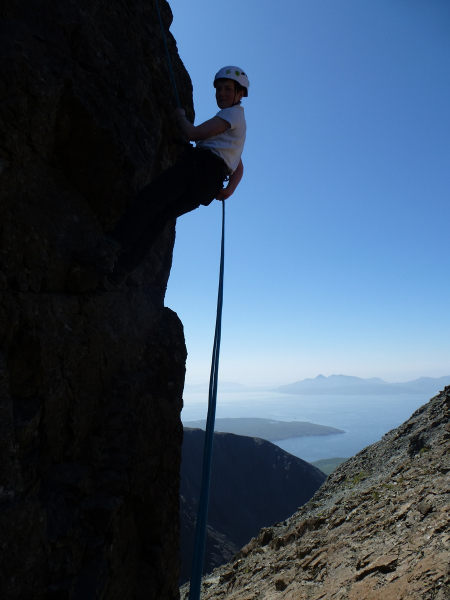 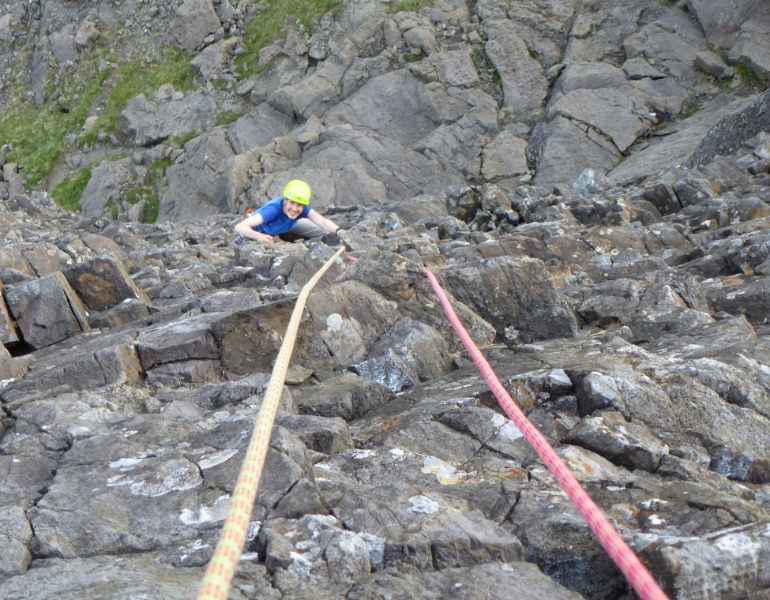 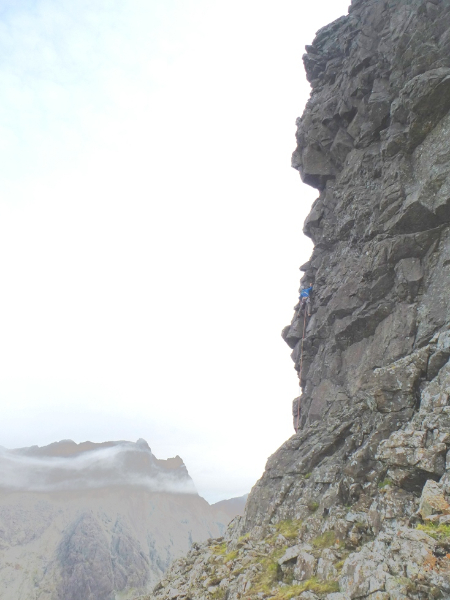 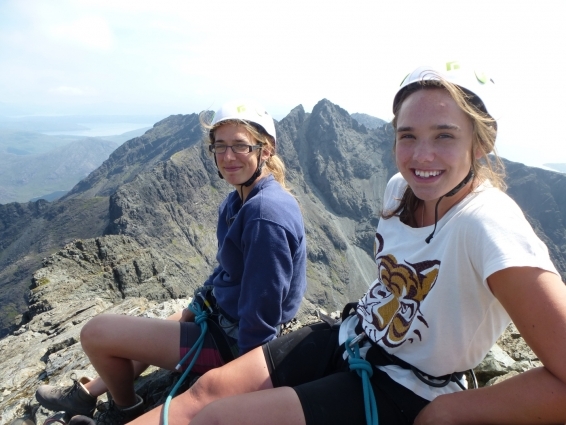 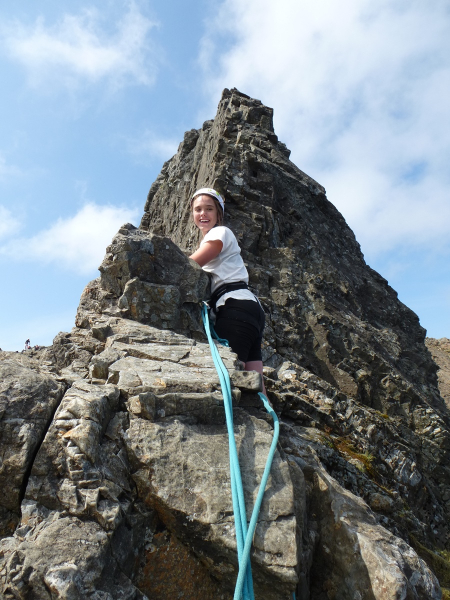 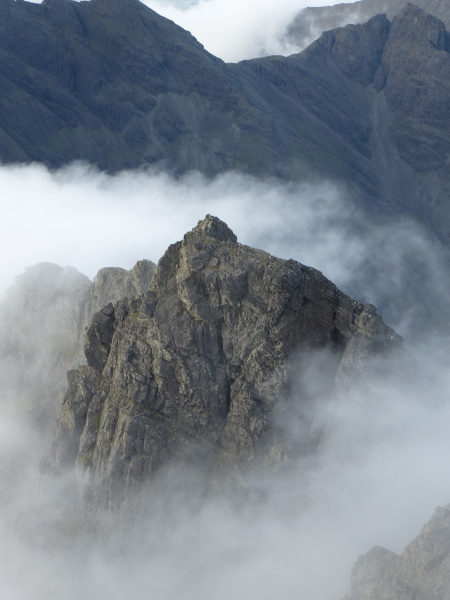 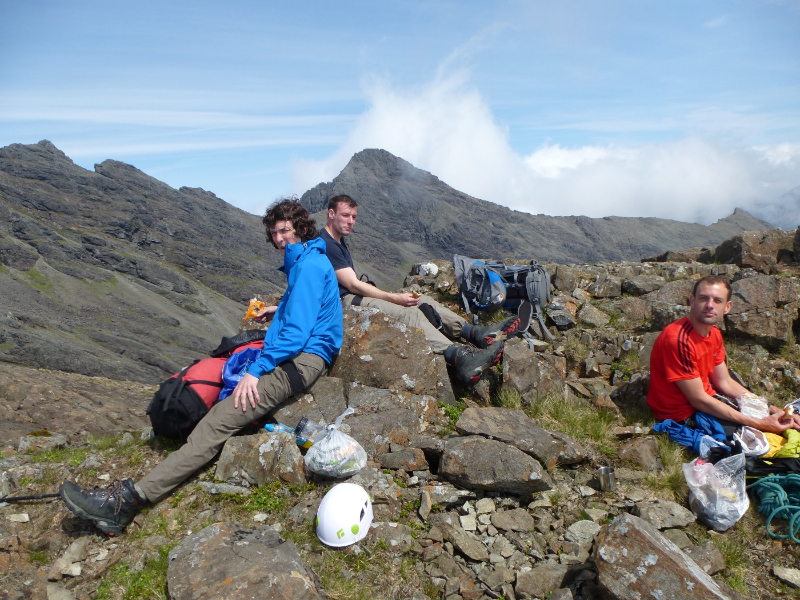 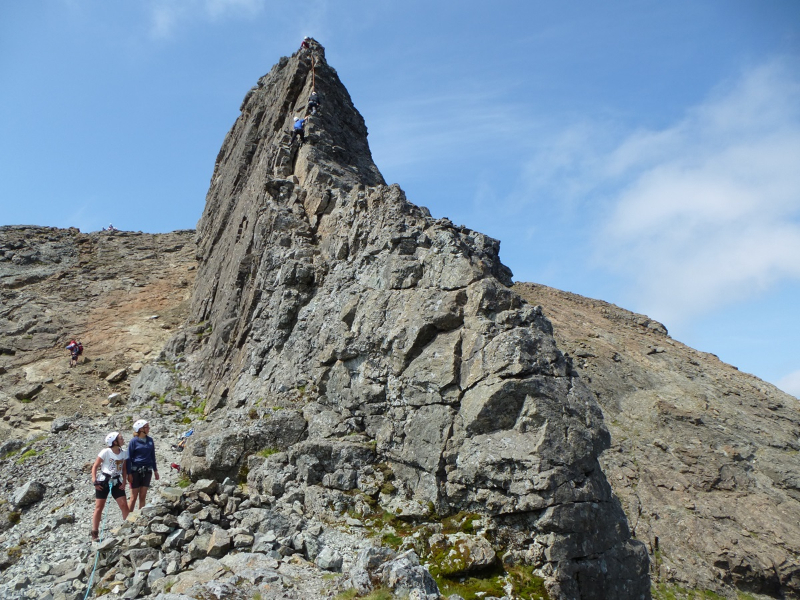 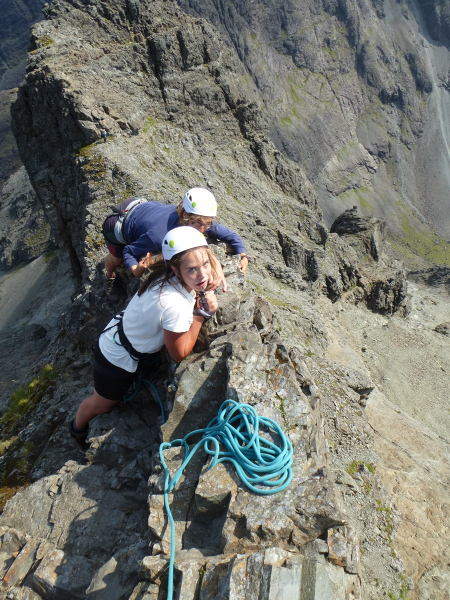 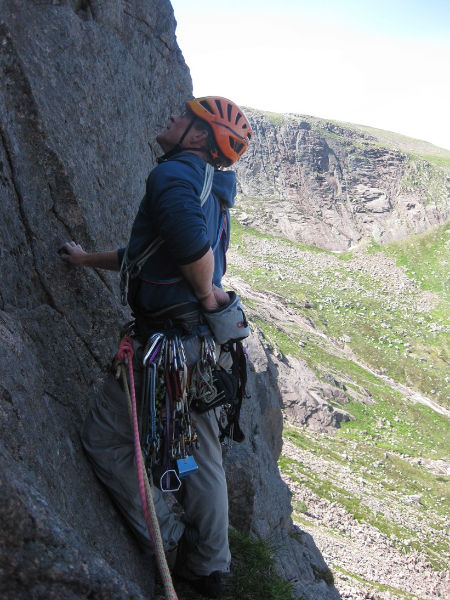 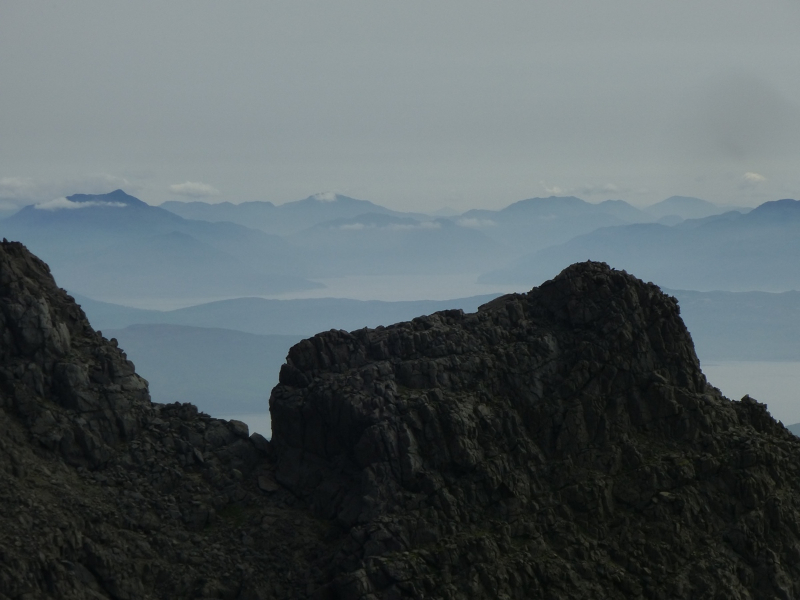 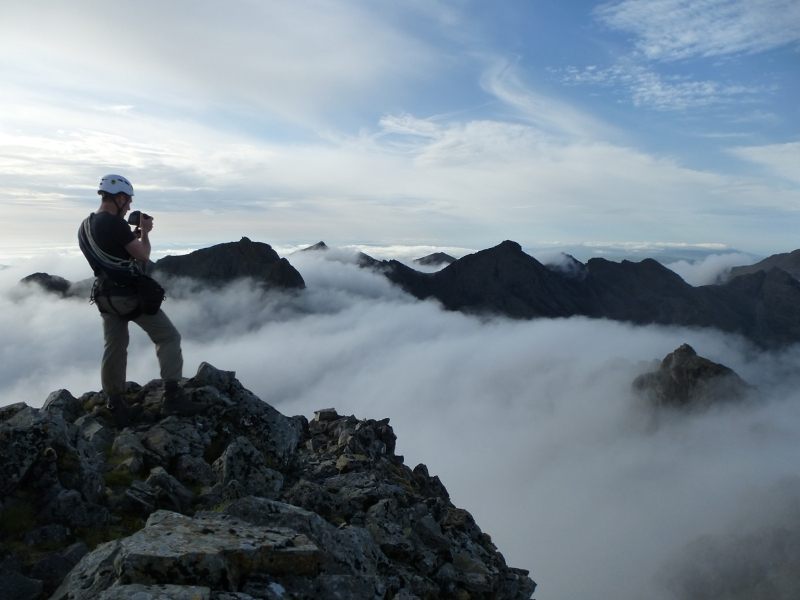 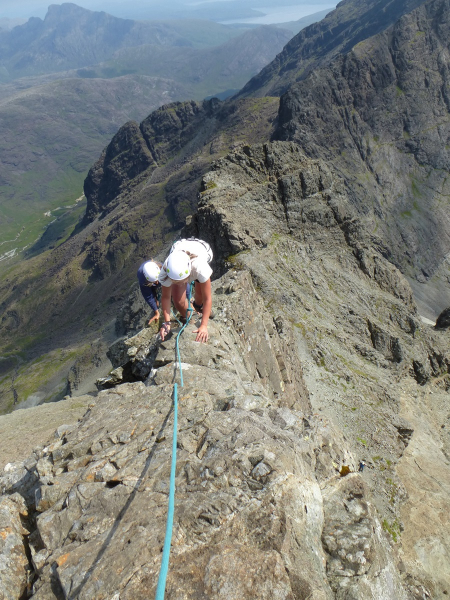 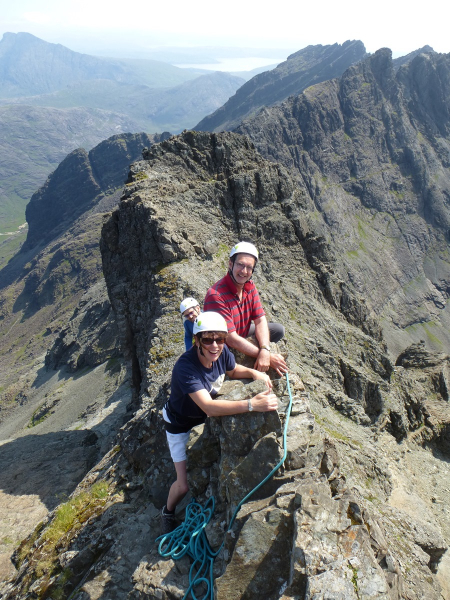 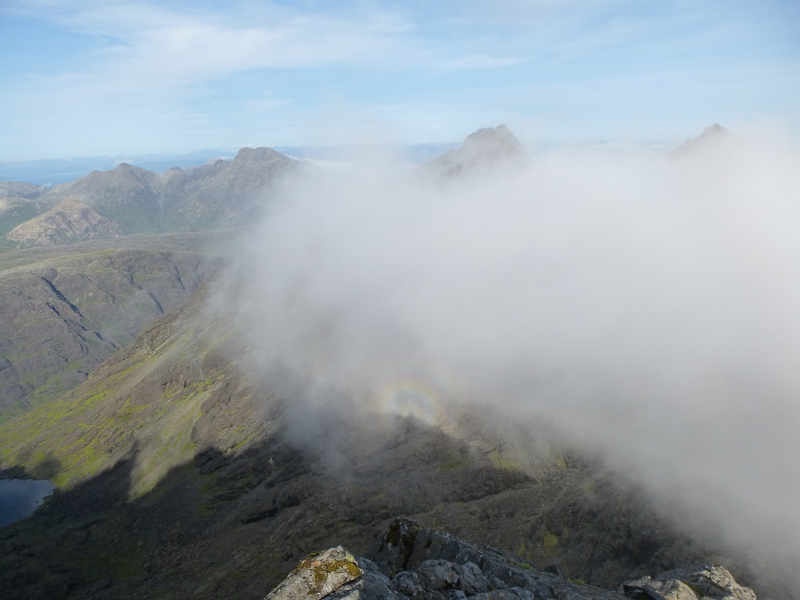 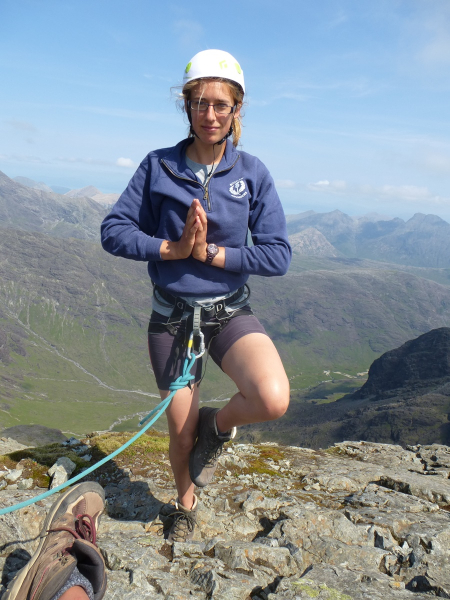 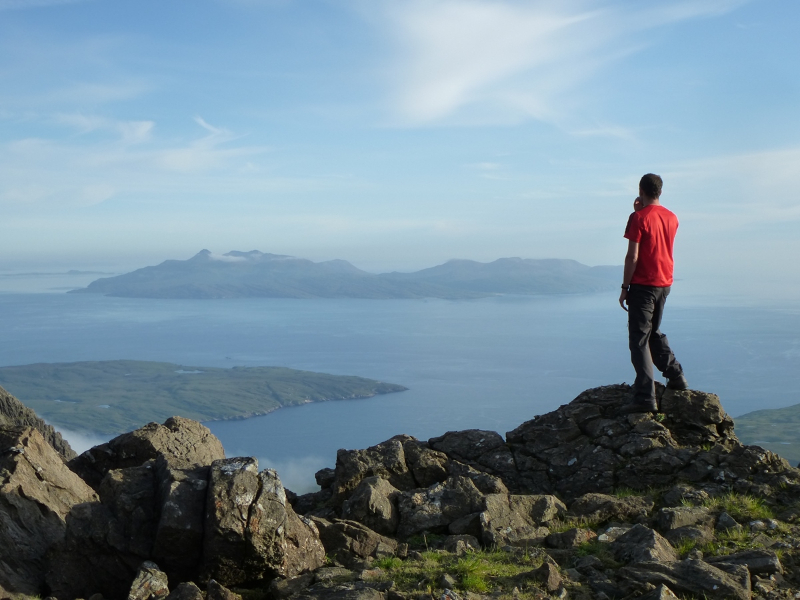 Summer finaly reached Skye on Sunday; perfect timing to warm up and practice on Clach Glas & Bla Bheinn. 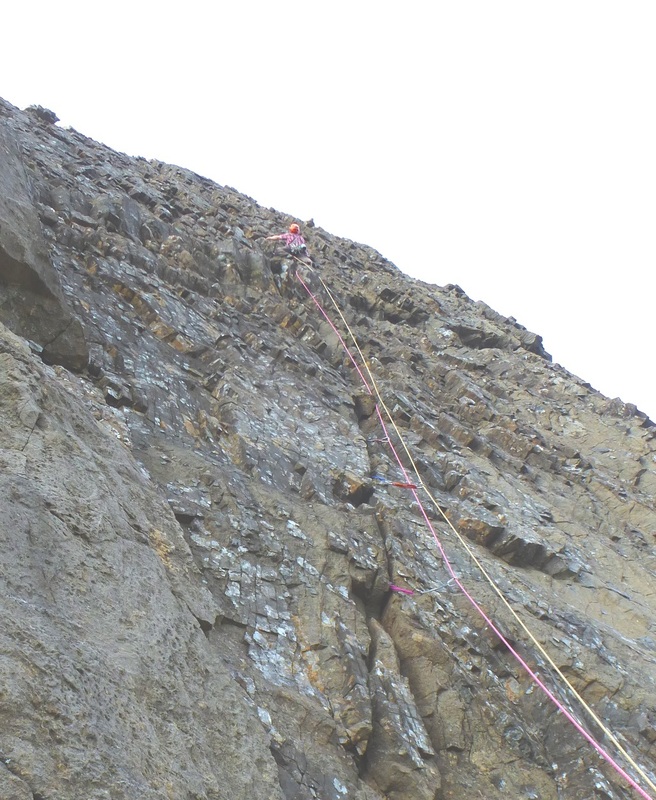 No excuses not to head straight for our Traverse attempt next day. 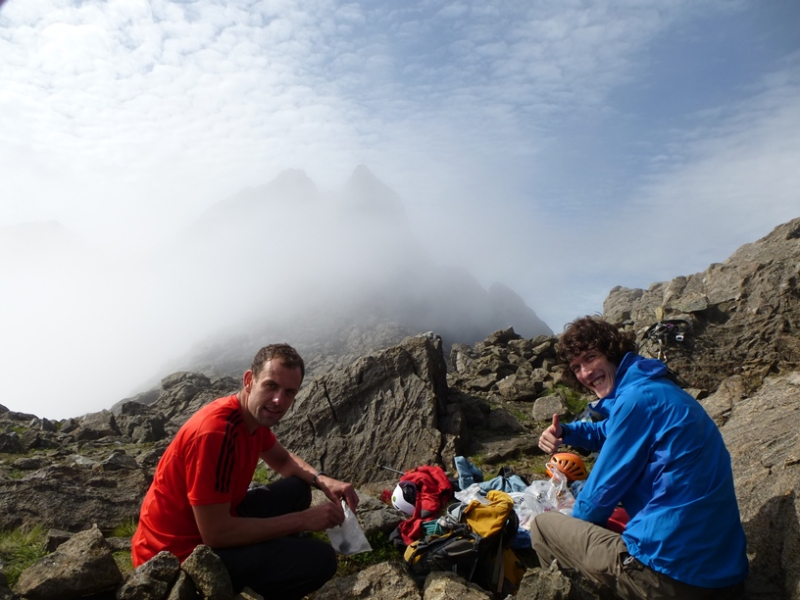 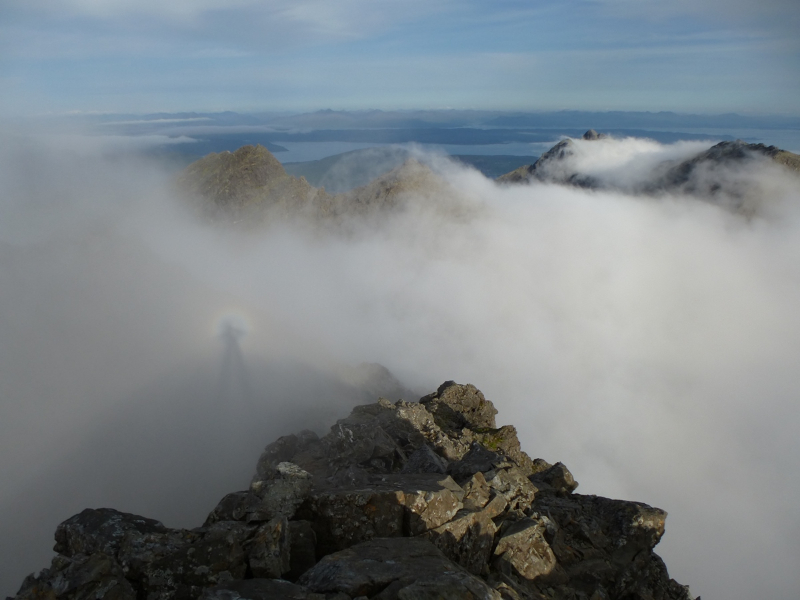 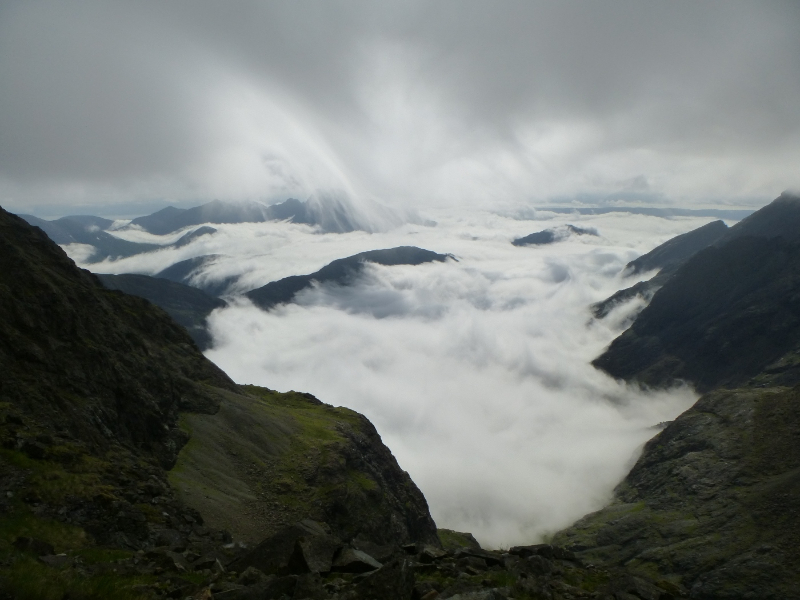 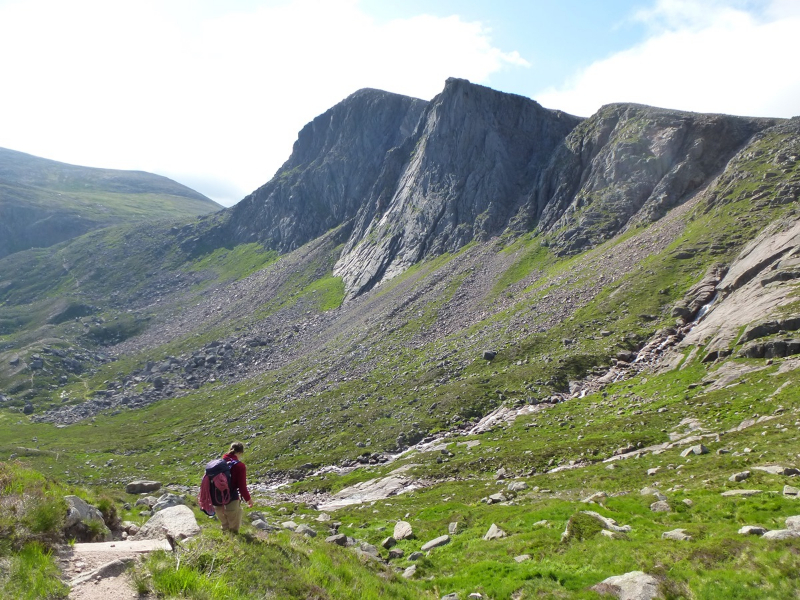 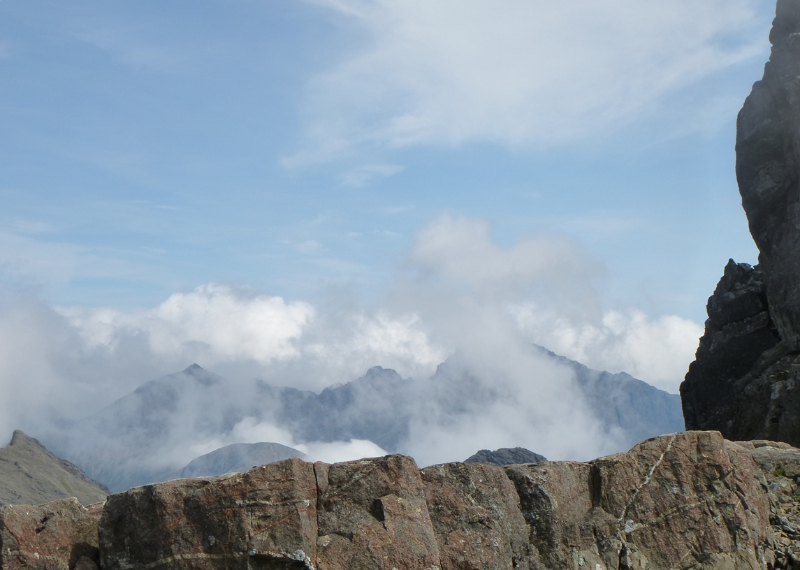 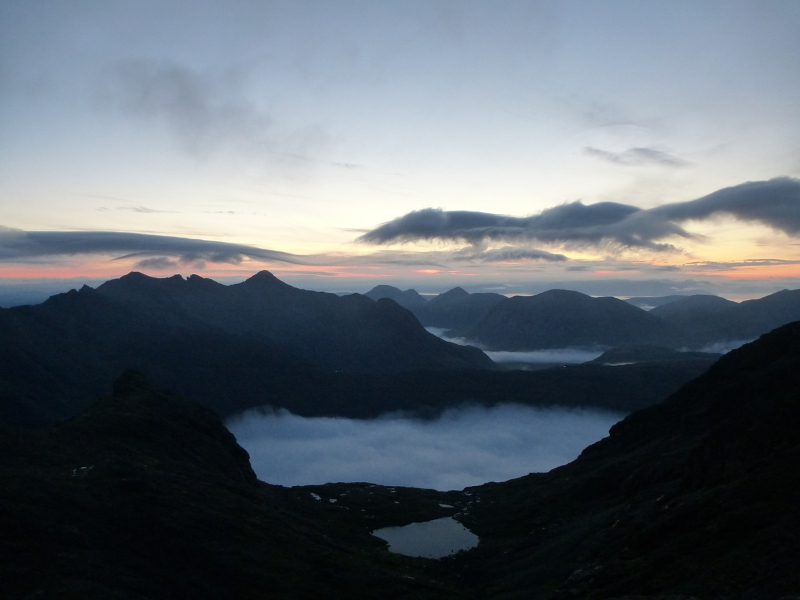 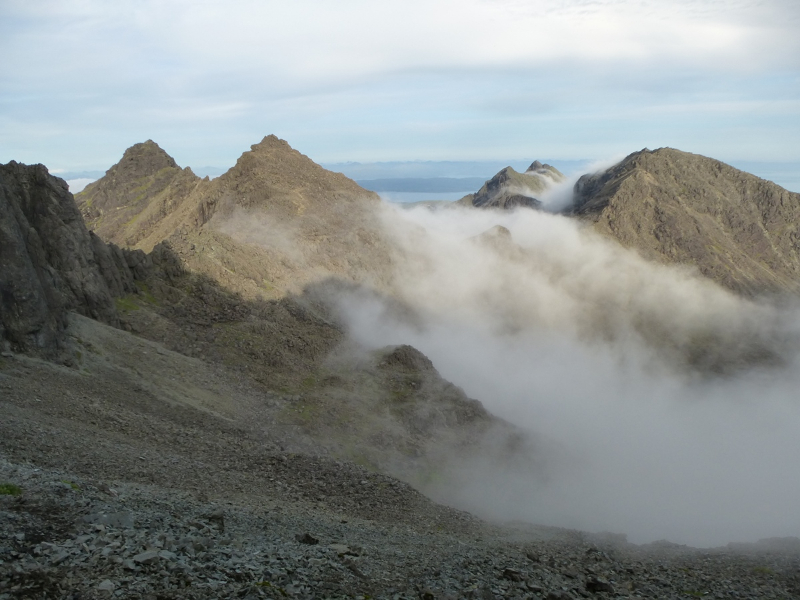 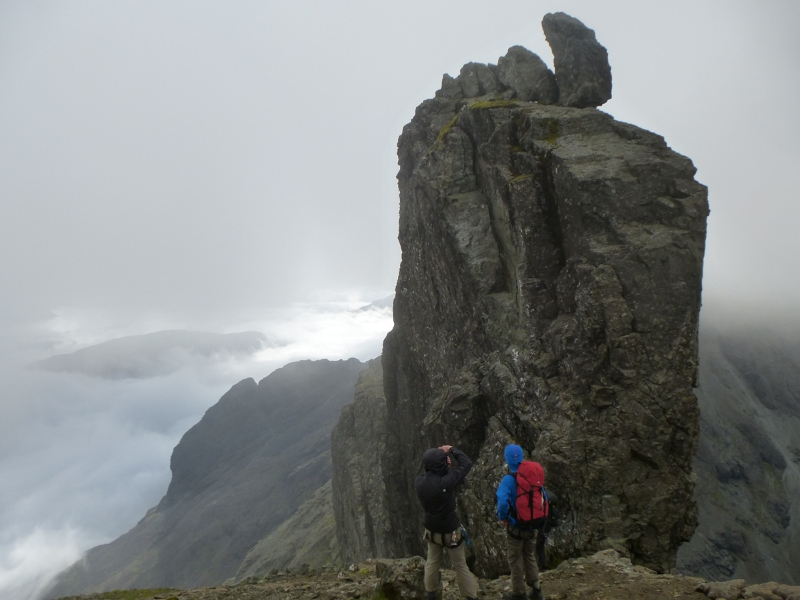 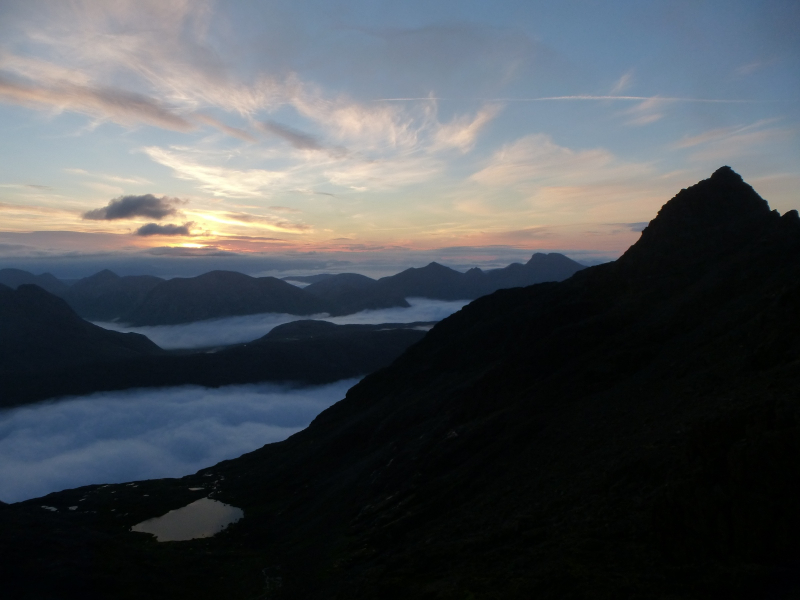 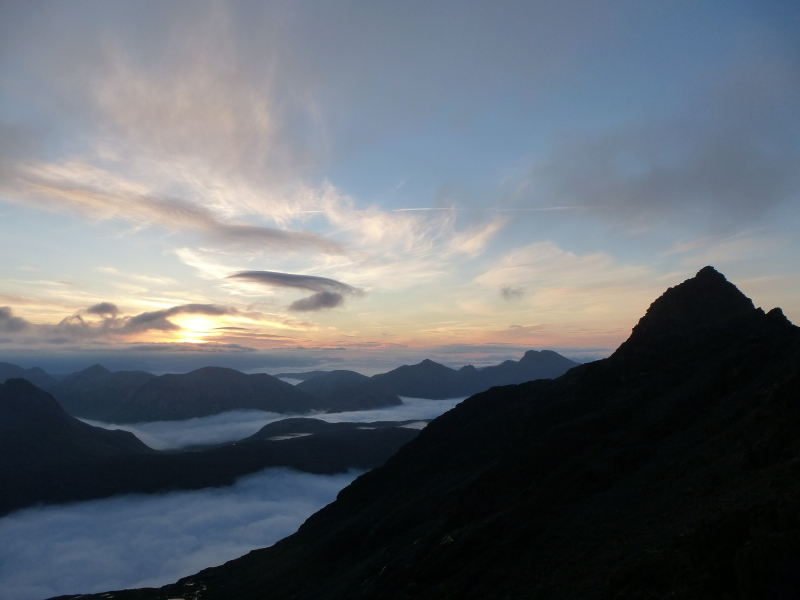 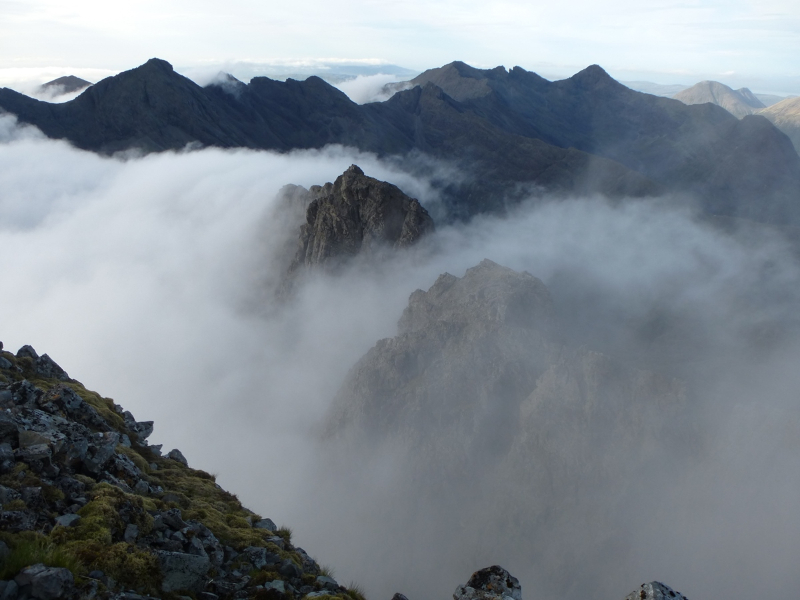 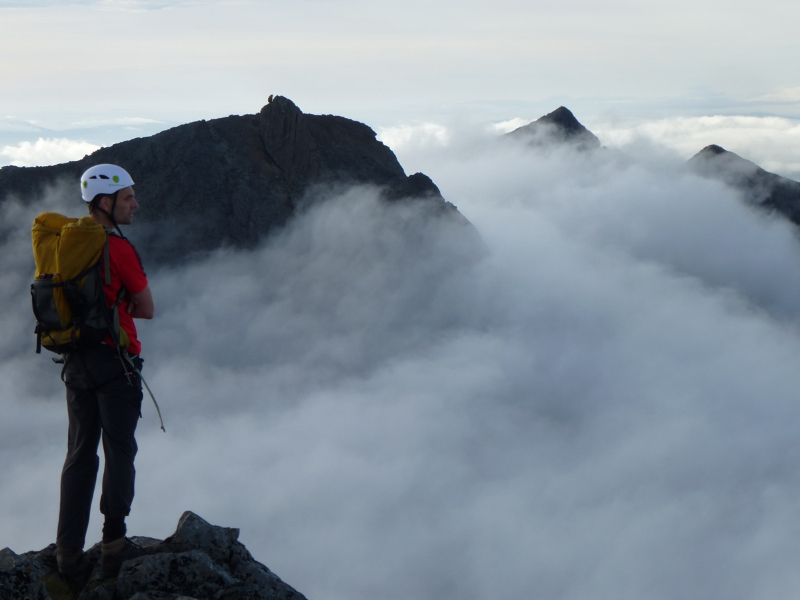 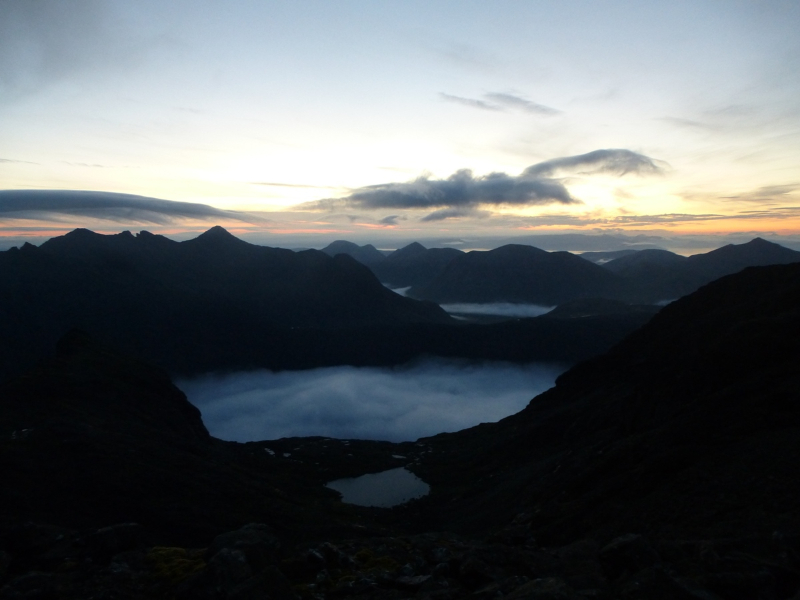 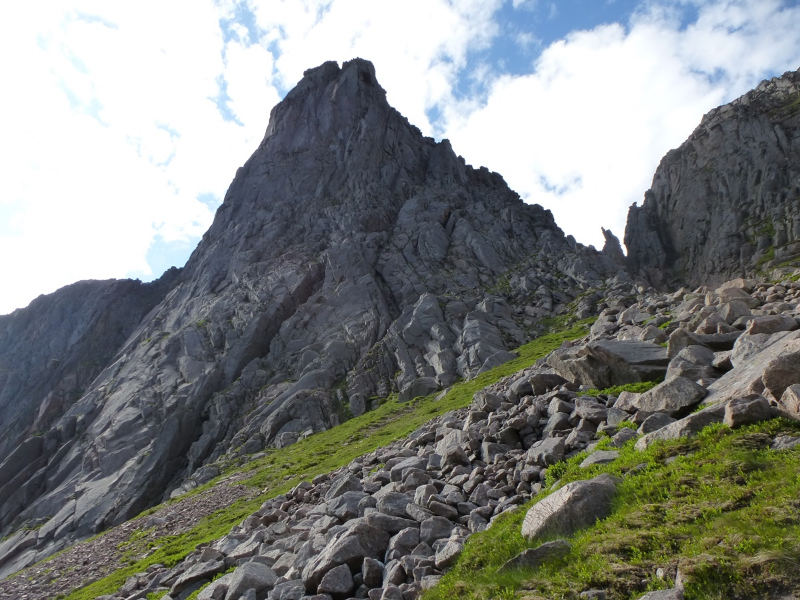 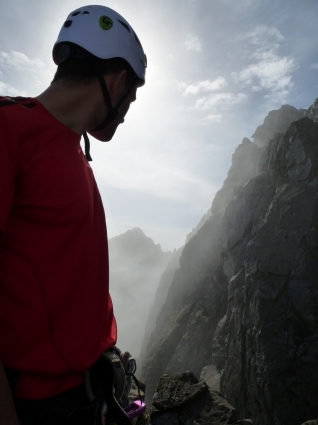 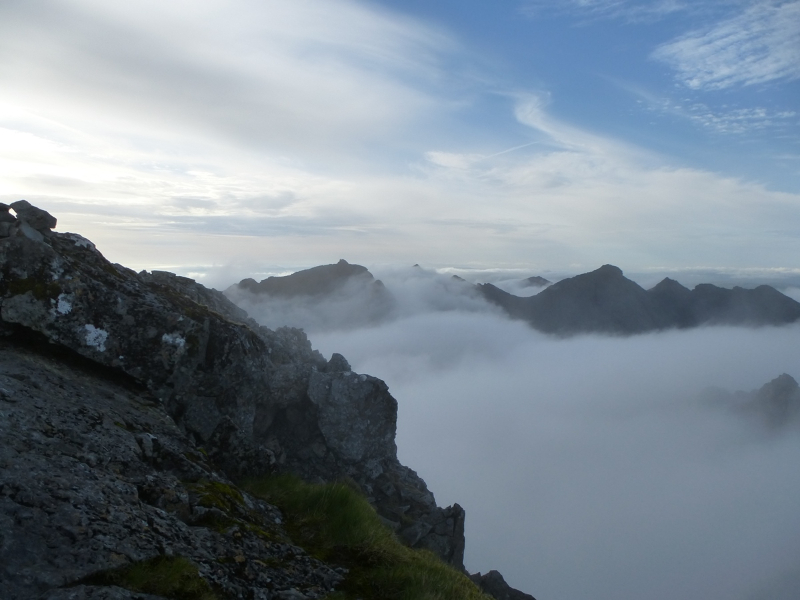 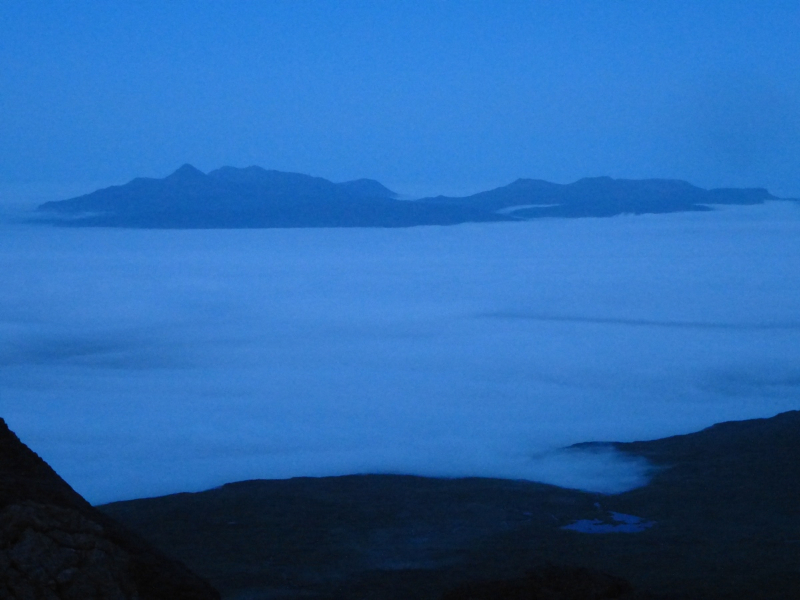 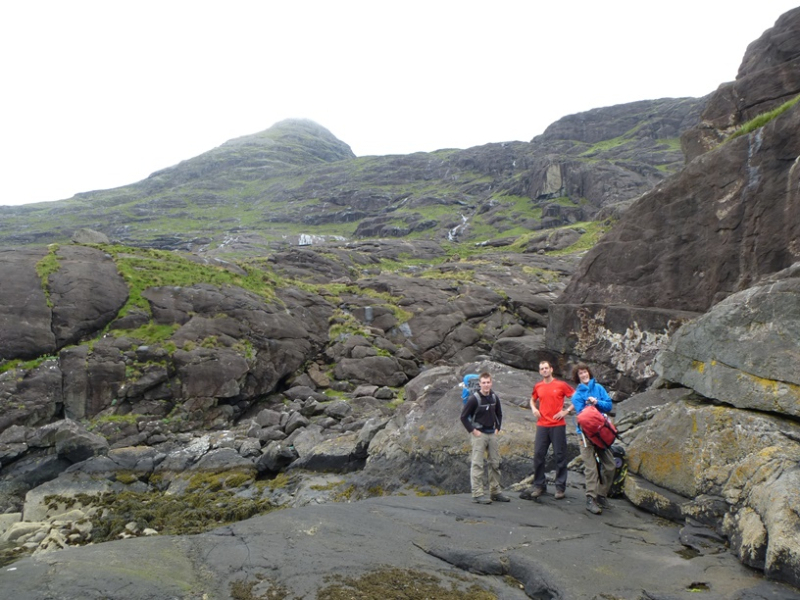 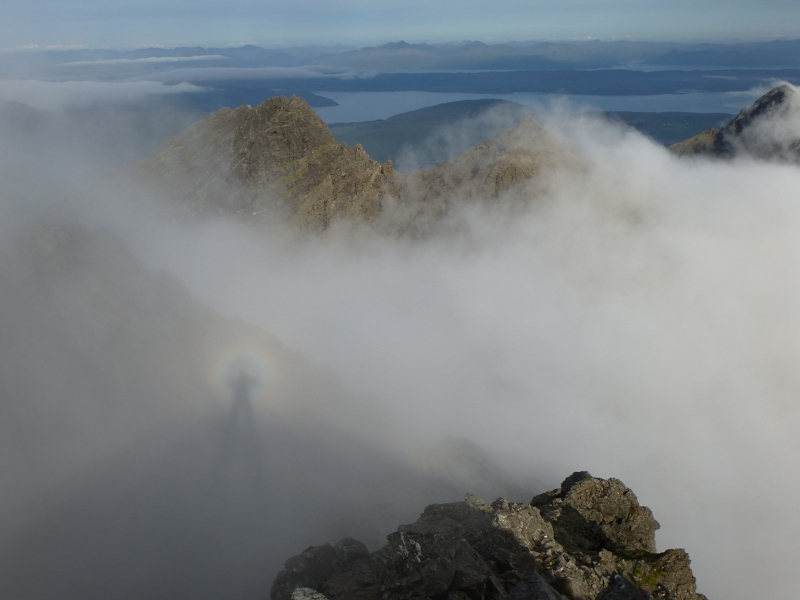 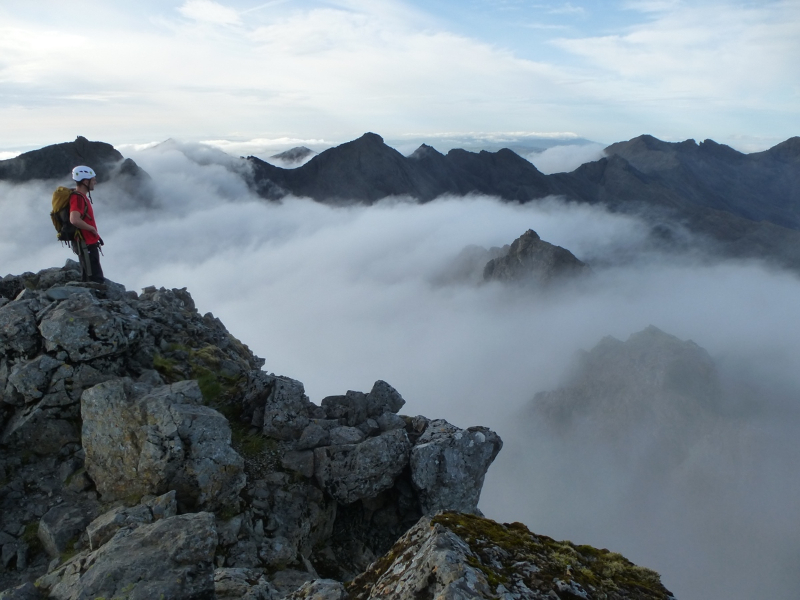 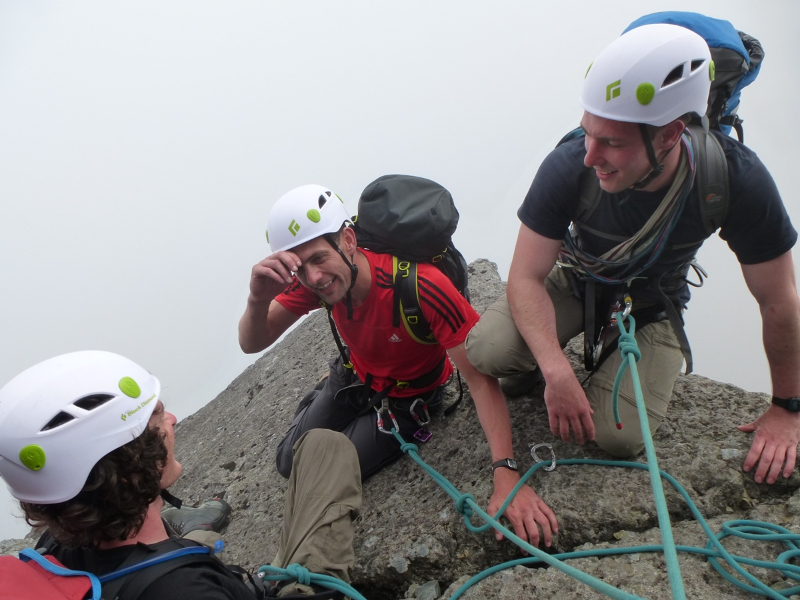 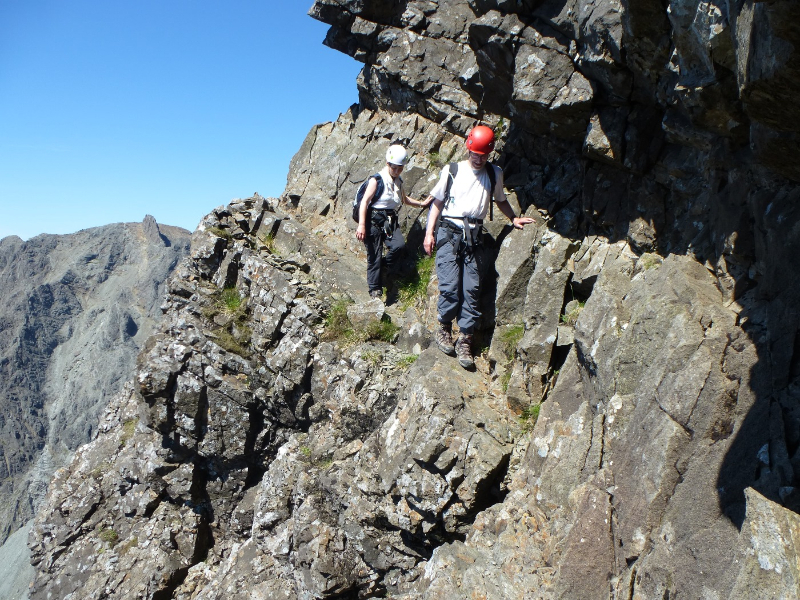 AquaXplore ran us straight in on the RIB for a very humid but shady ascent to Gars-bheinn. 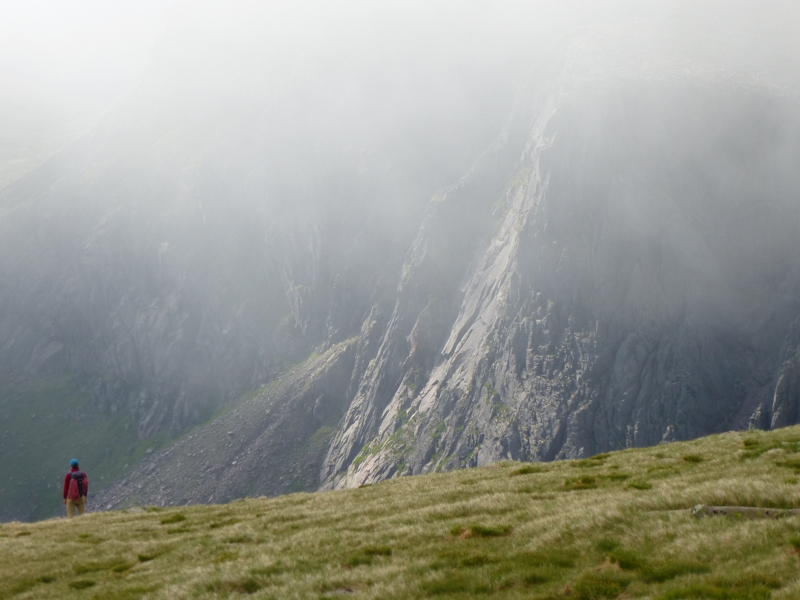 The mists were our friend, keeping us cool all day as far as the TD Gap. 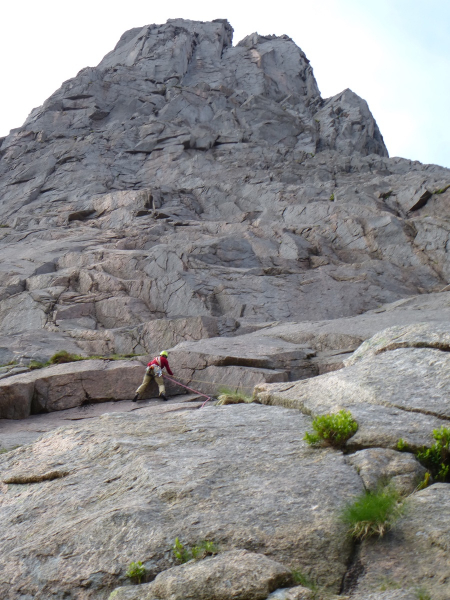 We climbed it in glorious sunshine but bivvied back just before it to take in the evening sun. 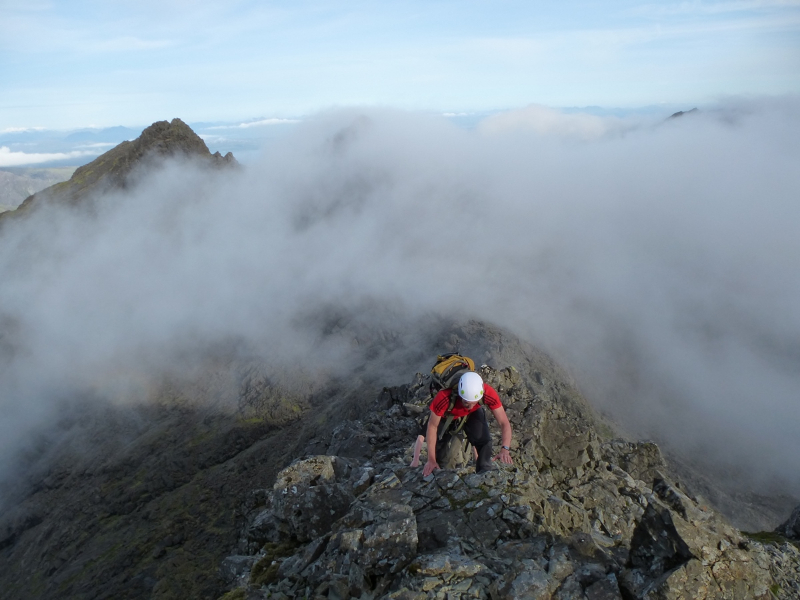 A 4am start, extended photofest and breakfast had us finally climbing onto Alasdair just after 5-30. 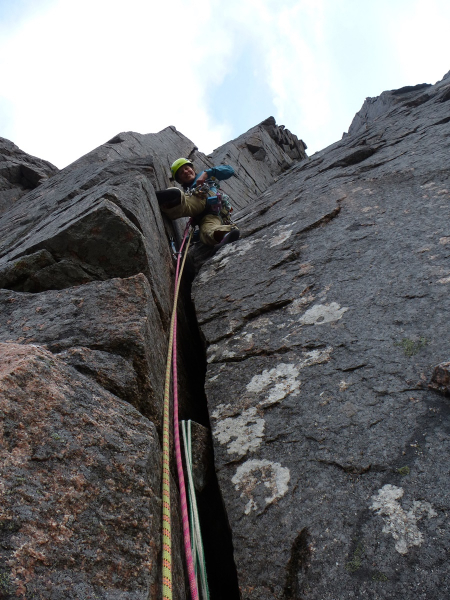 Slightly greasy as far as the Pinn then dry rock for the rest of the day. 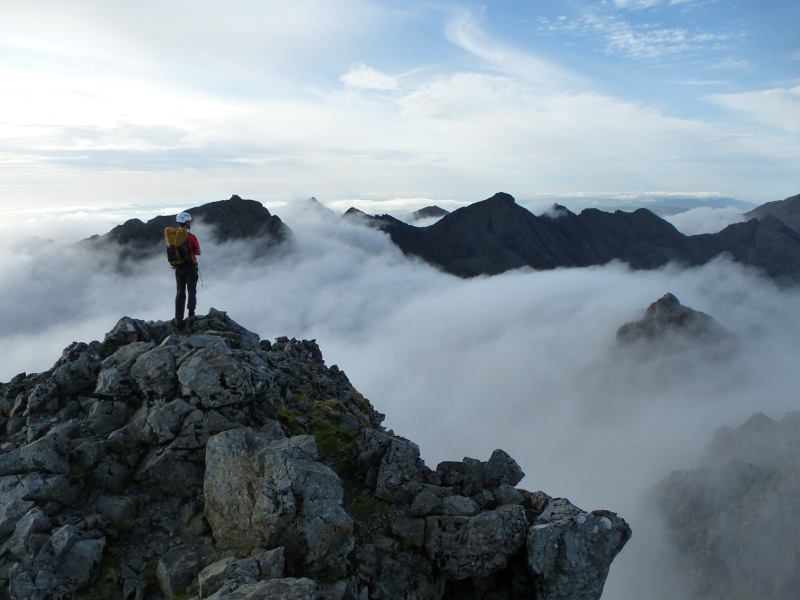 Bidean and Naismiths were day 2 highlights before popping out above the clouds to finish on Gillean with just the Pinn showing in the distance.